3. AUTHORISES Administration to consult with the Whadjuk Working Party and other relevant stakeholders regarding the potential renaming of Banks Reserve in accordance with the Policies and Standards for Geographical Naming in Western Australia. The public comment period was extended to 16 January 2019 although given the need to thoroughly assess submissions received during the public comment period it was not practical to present a Report to the Ordinary Council Meeting on 5 February 2019. Concerns were raised regarding the potential impact of any Reserve improvements on fauna inhabiting Banks Reserve. 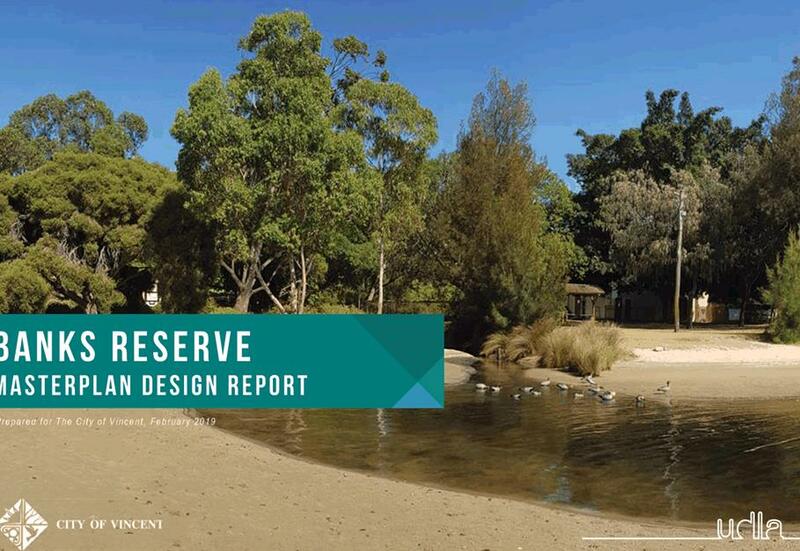 Administration acknowledges the importance of retaining flora and fauna within the Reserve, and can confirm that a detailed flora and fauna survey will be undertaken in consultation with the Department of Biodiversity, Conservation and Attractions prior to commencement of the detailed design phase to directly inform subsequent design and works phases. Key outcomes from this flora and fauna survey will then be included within the Master Plan Design Guidelines. There was a perception amongst some respondents that the proposed multi-purpose court was a full sized court that may attract significant usage. It should be noted that only a mini-court is proposed, and therefore the graphic within the draft Master Plan has been amended to provide greater clarity. The proposed mini-court is intended to be multipurpose to enable a range of modified activities including basketball and netball. Concerns were raised regarding the impact, and potential reduction, of open space that would remain within the Active Zone as a result of eco-zoning and installation of an oval perimeter path. The Active Zone is approximately 21,500 sqm and it is anticipated that the eco-zoning and pathway would utilise approximately 4,000 sqm leaving approximately 17,500 square metres of unrestricted open space. The proposed eco-zoning is considered essential to separate active zone users, including young children and dogs, from the main pathway that accommodates high numbers of cyclists. Eco-zoning also enables reduced groundwater use. 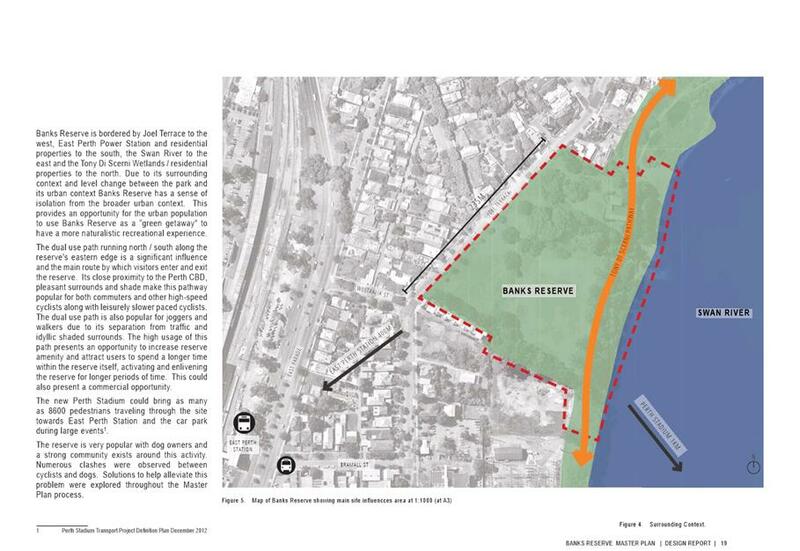 Banks Reserve is highly popular for dog walking and dog exercise, and concerns were raised that implementation of the Master Plan would lead to changes to the current ability to exercise dogs off leash. Administration can confirm that there is no intention to change or amend current activities and the Reserve will remain an approved dog exercise area where dogs are allowed off leash when the reserve is not being used for an approved activity. Information was sought on the outcomes of the proposed Summers Street Car Park improvements, in particular, clarity of the number of parking bays being created. Administration can confirm that this car park is being formalised and upgraded to include 15 parking bays, one ACROD bay and one motor cycle bay. 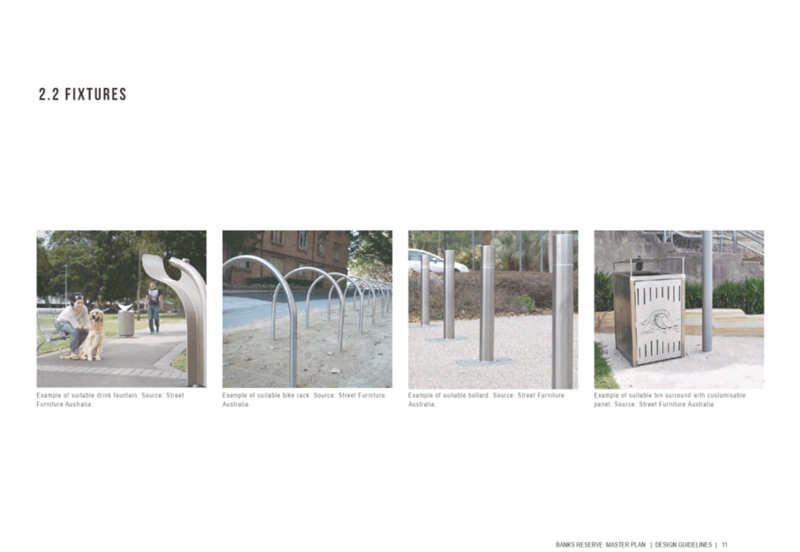 Comments were also received regarding the number, location and design of parking bays on Joel Terrace. These parking bays will be subject to detailed design upon the proposed demolition of Banks Pavilion and development of the Banks Plaza. The comments received will be further considered at that time and the car parking design will be subject to consultation with adjacent residents. Numerous comments were received regarding the current and potential utilisation of the Banks Reserve Pavilion. While the Pavilion has been assessed as being in ‘fair’ condition it does not meet current accessibility and public building standards. Many of the building components are rapidly nearing end of life with required works to bring the Pavilion up to a functional standard being extensive and costly. Approximately $35,000 is spent per annum on building maintenance but this does not address the current accessibility or public building deficiencies. It is anticipated that these building maintenance costs will continue to increase over time as the building components reach end of life. 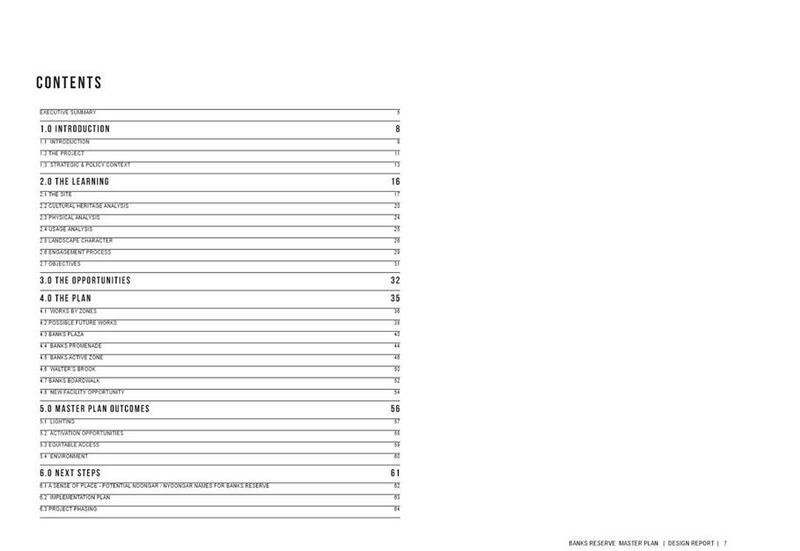 Administration has again assessed current Pavilion utilisation (2018 data provided below). While the facility occupancy rate is quite high this is primarily due to the existing Kiddies Learning Hub Pty Ltd Licence Agreement that expires on 28 June 2019. Facility occupancy is significantly lower when Kiddies Learning Hub usage is excluded. Queries were raised regarding usage and management of the proposed kayak storage shed. These specific arrangements are yet to be determined although Administration anticipates that a licence agreement would be established with the Perth Paddlers and Kayak Club with accompanying conditions. The following table summarises the key feedback received during the entire public comment period including the initial 14 November 2018 to the 28 November 2018 period and the extended 14 December 2018 to 16 January 2019 period. · Notice in the City’s e-Newsletter. Keep the existing hall or a new enclosed structure that could be used all year round and for a wider range of activities than the Plaza. There is plenty of open space in the Reserve for people to use. There are too few community halls as it stands. An unnecessary addition that will create a harsh unnatural zone. Maybe modernisation of the facility but really that’s all. Is the removal of the facility only to justify the later building of the second stage. Toilet facilities should be updated. The graphic makes the toilet block seem to be the focus of the plaza. More work is needed to ensure that the toilets are an ancillary component and not the focus – possibly relocate them, out of the way but visible. There appears to be no justification for removing the existing facility. The approach is particularly puzzling given that the City has previously talked about the environmental benefits of adapting and reusing buildings. Do not understand how the well-used facility has become a problematic venue. There is minimal support for demolishing the community hall and the toilets attached to the building. Looks great. A wonderful new community place. Some realignment of the existing car park could be undertaken at an early stage and this monitored to see whether there is an increase in the usage of the car park as the redevelopment progresses. The current buildings and toilet block need upgrading so very necessary work. The existing buildings and toilet facilities could have a spruce up and some improvements but to knock them down because the maintenance is too expensive is wrong. The existing community facility is nearing the end of its useful asset life and no longer compliant with accessibility requirements or current building standards. The Plaza is intended to facilitate improved activation including events, pop-up vendors and informal recreation. This partially sheltered space would be sympathetically designed to allow flexible use by the community. Consideration will also be given to ensuring the design adheres to Crime Prevention through Environmental Design principles. 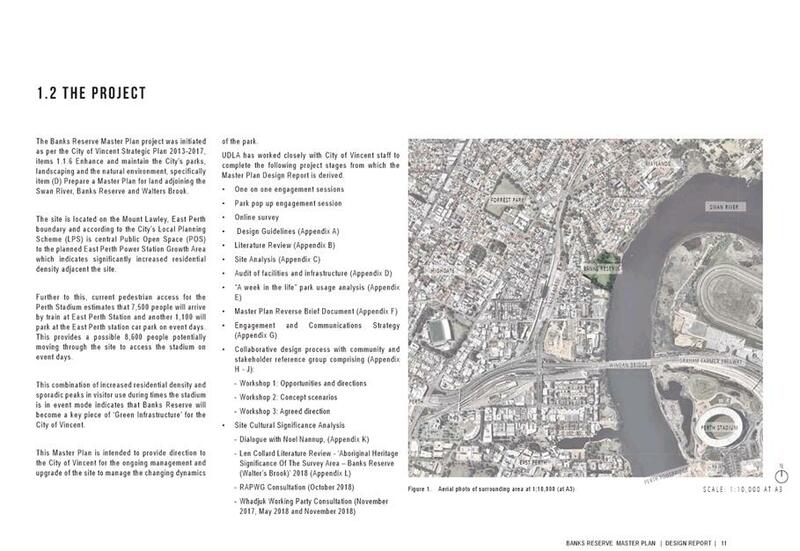 The proposed future car park remains subject to further feasibility and business case investigations. More seating and BBQ’s as well as a parenting facility within the toilet and an outdoor shower are required. Improvements to picnic tables and shade are required. More areas for family gatherings are supported. Important that more covered seating/BBQ tables are available for eating or other activities. Will there be bike repair stations? The Master Plan proposes additional seating, BBQ amenities, a new toilet facility and improved shade within the Plaza area. The proposal for an outdoor shower can be considered during detailed design of the proposed toilet facility/kayak storage area. Bike racks and bike repair facilities will be considered within this zone. Install a small ferry capable jetty for future usage given the proximity to Optus Stadium and Claisebrook. The impact of beach erosion will need to be considered should river access by kayakers increase. Both the Plaza and Boardwalk zones have incorporated opportunities for better access and to interact with and view the Swan River. Administration and the Project Reference Group identified these access options as less intrusive than a formal jetty. Consultation with the Department of Biodiversity, Conservation and Attractions (River and Estuaries Division) during the detailed design phase will ensure necessary consideration and mitigation of any erosion implications. Concerned about the lighting level as this should be sensitive especially at night as it will affect both fauna and local residents. It is not in the interests of the Reserve to provide such lighting as it will only encourage anti-social behaviour. If lighting is upgraded it should be turned off by 8pm at night. Lighting along the dual use path to Summers Street is appropriate. Throughout the Master Plan development and consultation process the safety of park users was highlighted as a concern and provided the basis for improved lighting. Consultation with the Department of Biodiversity, Conservation and Attractions (River and Estuaries Division) during the detailed design phase will ensure necessary consideration and mitigation of any unintended fauna impacts. Lighting times can be managed to balance any adverse impacts for adjacent residents. Pop up container cafe looks rather small for the expected higher volume of people. A proper café or kiosk should be considered. Seating, umbrellas and shelter is required. Would be better to provide power and water connection for a trailer/movable coffee/restaurant van instead of the container so that more businesses could be assessed for viability. This could even be during summer evenings when special events are held at Banks Reserve. A pop up café is OK. I'm not in favour of a permanent café facility. The proposed pop-up café has been identified as the most viable option and subject to commercial analysis may lead to a more permanent style facility in the future. 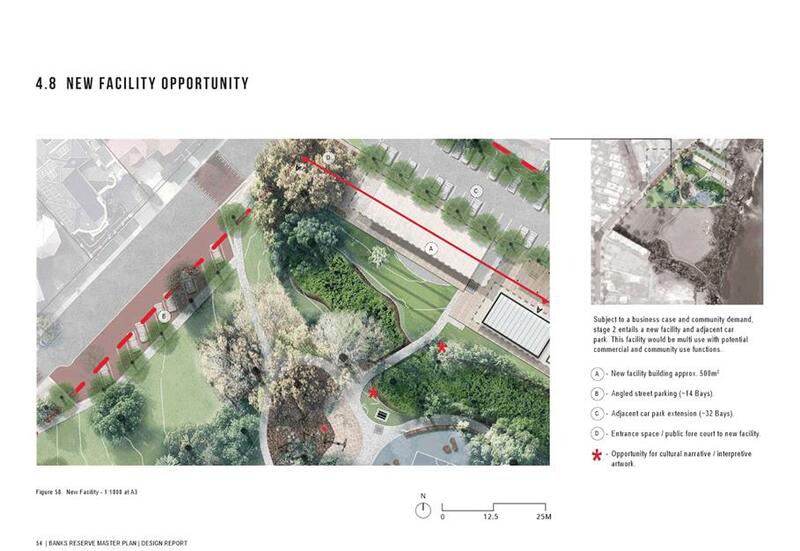 The Master Plan proposes additional seating and improved shade within the Plaza area. Duck faeces will need to be regularly removed from the hardstand and decking areas. Noted. Effective asset management and maintenance of the reserve remains an important City responsibility. Not supportive of the proposed parking changes. Provide access for deliveries and ACROD permit holders but keep other motorists out. 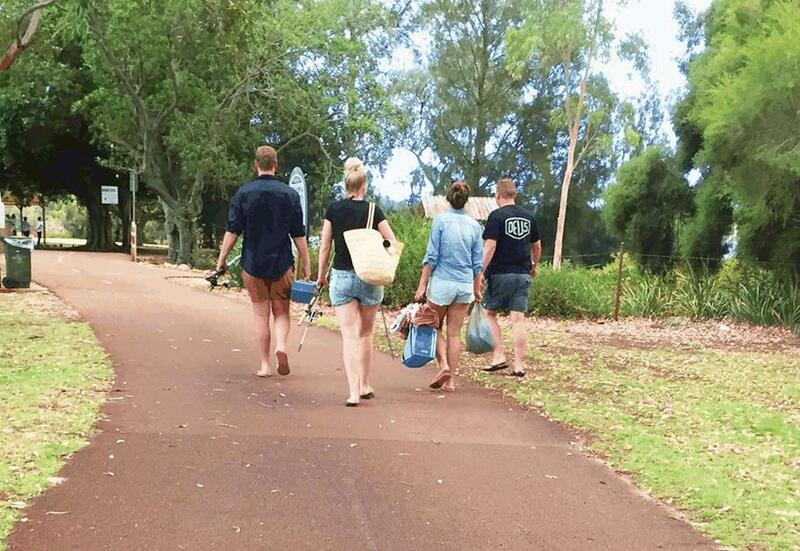 Local people should be encouraged to walk to the park and non-locals have access to public transport options. I do not support the retention of the existing car park. If the ‘formal’ part of the existing infrastructure is removed (i.e. demolition of the hall) then I don’t see a need for this car park. 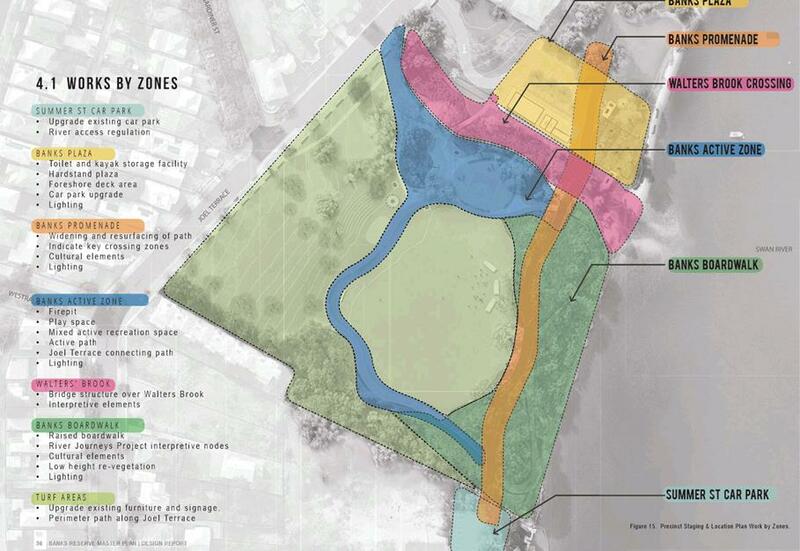 The recently adopted POS Strategy has identified Banks Reserve as a “neighbourhood park” which is defined as having a catchment of a “10 minute walk”. 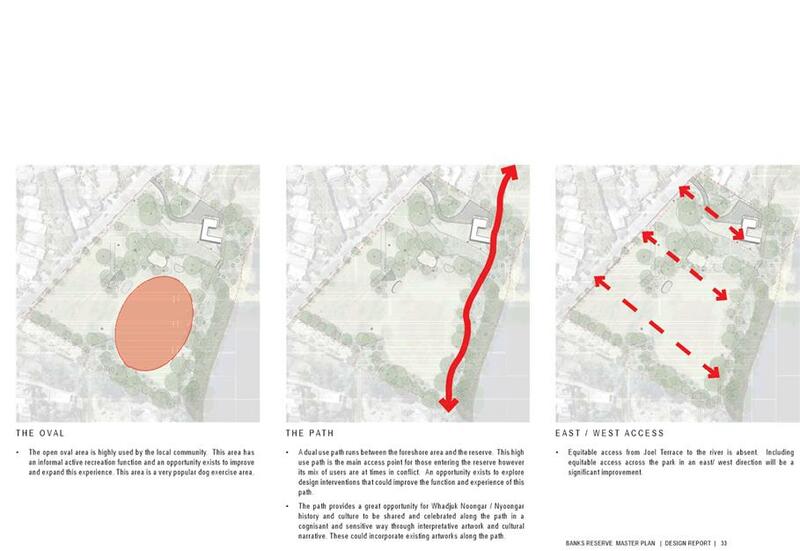 The masterplan should accept that is the adopted vision for the area – not a park that requires people to drive to it. If the POS Strategy is wrong, then change that, don’t ignore it. The small carpark at this northern end should be limited to mainly ACROD parking and short-term parking for people dropping off equipment (for picnics etc.). There is considerable local opposition is to the building of a car park adjacent to the mud brick residences that adjoined the houses opposite Bream Cove in Joel Terrace. Development of the Plaza area, including removal of the existing community pavilion, will provide the opportunity to realign the car parking bays and improve both safety and accessibility. 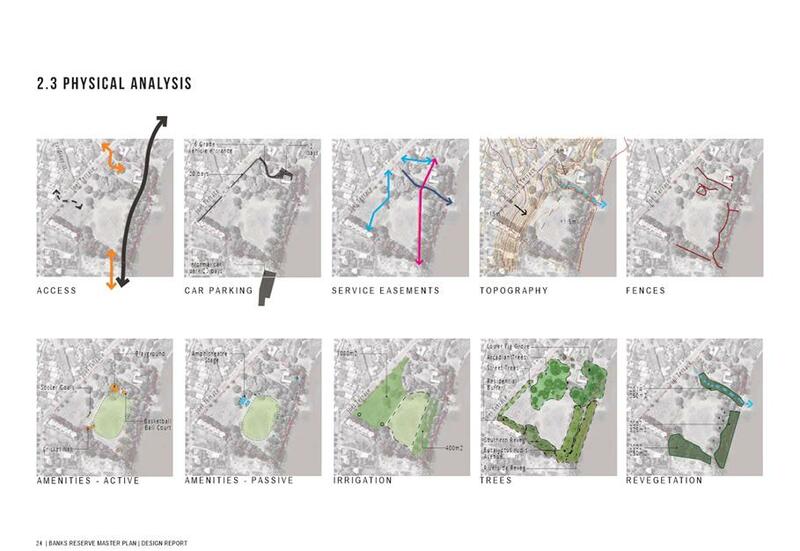 The Master Plan focuses on improving existing car parking rather than significantly increasing car parking. As a ‘neighbourhood’ public open space it is agreed that walking and cycling access should be promoted. 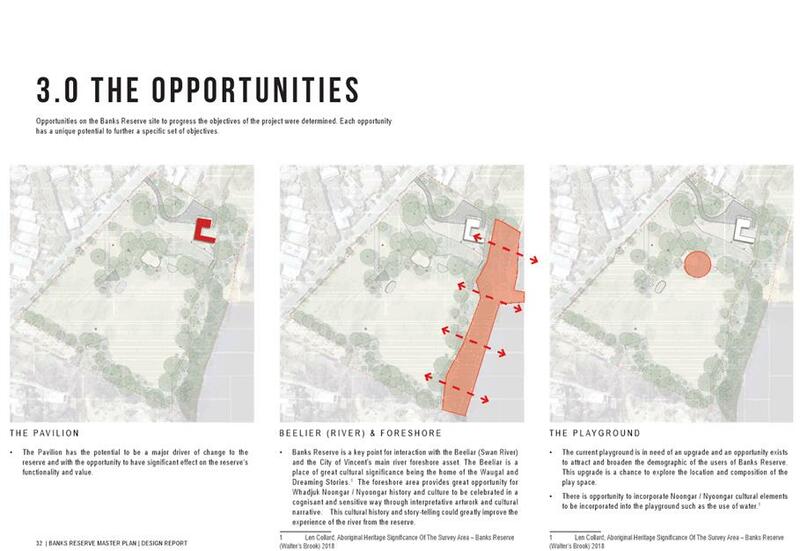 The reference in the POS Strategy that a neighbourhood park is a 10-minute walk is related to provision of public open space within that distance. Do not support decking area, prefer existing grass. This will introduce a trip/slip hazard, detract from the natural atmosphere and increase maintenance and cleaning costs. I would prefer to see more shade on the open deck nearer the river, not just around the toilets. 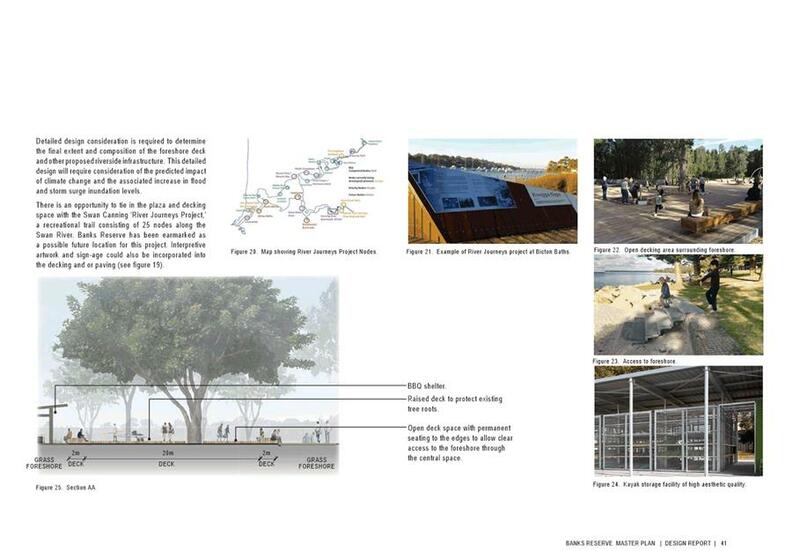 Concern that the visuals presented in the Draft Plan seem to show the timber decking extending up to the beach which would mean some of the trees on the beach foreshore would need to be removed. 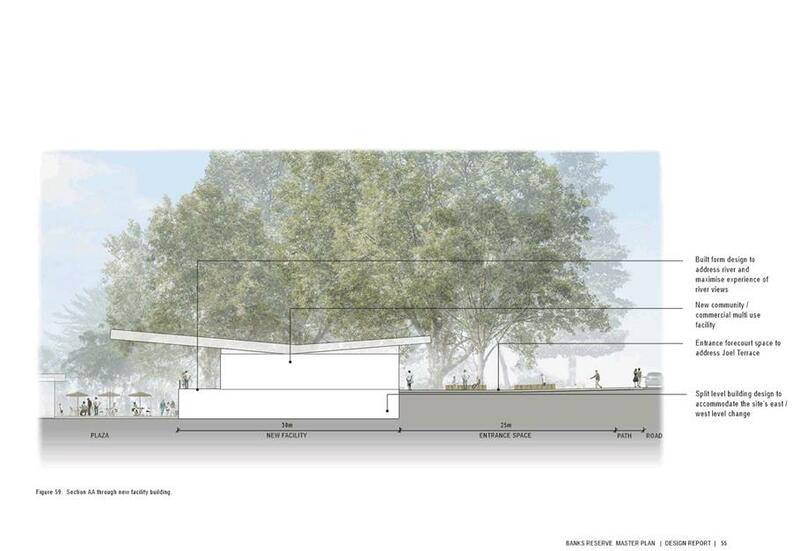 The portion of the Plaza area with proposed decking has somewhat limited area grass growth as it is underneath large trees which provide shade. The decking would allow the space to be better utilised while maximising the shade provided by the trees. Comment is noted and a balanced approach and appropriate action will be taken. Doubtful that kayak storage area will be used given the risk to damage to equipment and ease of transporting equipment. Unless a club is involved kayak storage is unlikely to be used. Will there be a fee for kayak storage? Object to money being spent for the benefit of a small number of people. Kayak storage is not necessary when everyone who owns a kayak has the means to transport them home to their own private storage area. Kayaks and canoes mostly enter the river from the Summers Street end. Overall good ideas. One suggestion: many kayakers actually paddle surf skis. Surf skis are up to 6.5 m in length. Please consider making the kayak storage facility wide enough to accommodate this kind of surf ski. Like the concept of the Banks Plaza upgrade. I question if there is a need for canoe/kayak storage. The need should be established before embarking on providing canoe storage and river access. I’m not convinced that a canoe storage ‘shed’ is justified, and certainly not in the middle of the plaza. The proposed kayak storage has been included in the Master Plan based upon consultation with a local club who currently use the Reserve and River. It is anticipated that the storage area will assist with growth of the club and opportunities for the wider community to engage in this recreational activity. The club will be required to enter into a licence/lease agreement with the City with associated costs and responsibilities. Too close to residential dwellings, move to Summers Street end. 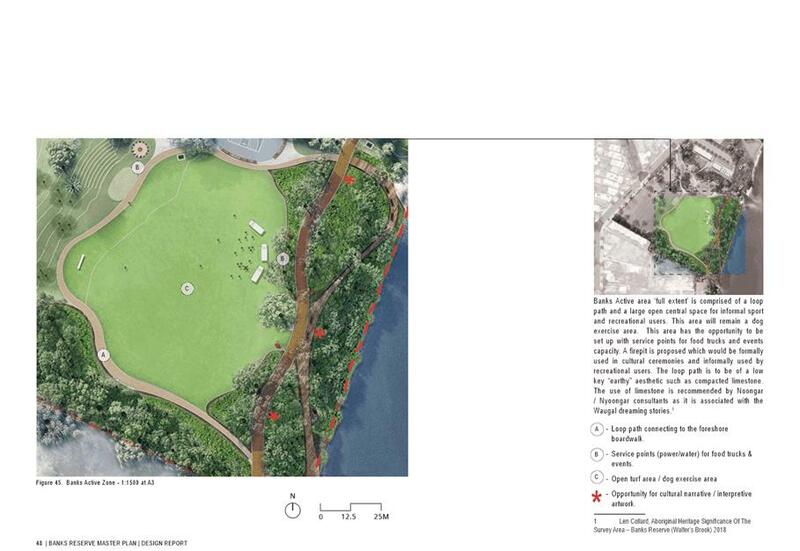 The Plaza area has been proposed where the existing community pavilion is located. Relocation to the Summers Street end of the reserve is not practicable given the existing vegetation and is not consistent with consultation inputs during preparation of the Master Plan. Pop-up café is not required as people bring their own food and drink. This would not be viable except when there is an event/function at the Reserve. Improved drainage in the car park is required. The pop-up café has been proposed to determine viability at the reserve. Any drainage issues will be dealt with during the Plaza detailed design and construction phases. Not sure why the existing toilets would be demolished as a priority when the rest of the building is not proposed for immediate demolition. The poor condition and need to upgrade the toilets was identified as a high priority due to both safety and amenity concerns. A contemporary, modular toilet is proposed until construction of the new toilet facility is completed. Ok if regenerated area left alone. 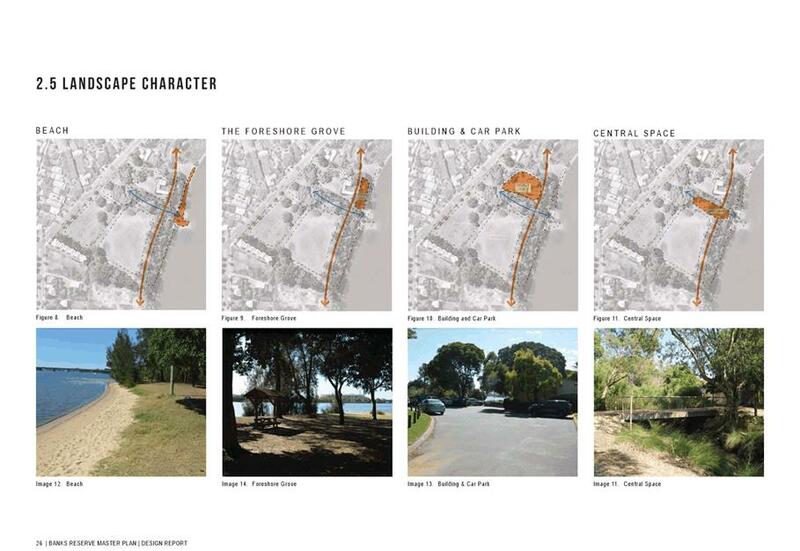 The existing trees at the foreshore of the Banks Plaza area must be protected and retained, these are the trees between the river and the existing buildings and car parks in this location. The Master Plan aims to maintain the natural environment while improving opportunities to access and interact with the river. Revegetated areas will be maintained where possible with additional plantings to replace any lost vegetation through the establishment of the boardwalk. Consultation with the Department of Biodiversity, Conservation and Attractions (River and Estuaries Division) during the detailed design phase will ensure effective management of vegetation. Support in general but unsure of the need for a 4-metre wide path and it is doubtful that the path can be widened without damaging the roots of mature trees. Love the idea of getting more vegetation along the path. Excellent upgrade to existing pathway. The proposed widening of the path to 4 metres is to comply with Department of Transport standards as the path is classified as a Recreational Shared Path. This will assist with reducing conflicts between cyclists and pedestrians which was highlighted throughout the community consultation process as an issue. This will be a welcome improvement. Please ensure that the revegetation is no higher than half a metre as this will allow for river glimpses across the Reserve. Planting vegetation along the side of the path will increase congestion as at present people can move off the path onto the grass. Support the vegetation to provide a barrier between the open oval and the path and reduce conflict between cyclists and dogs and wandering children. 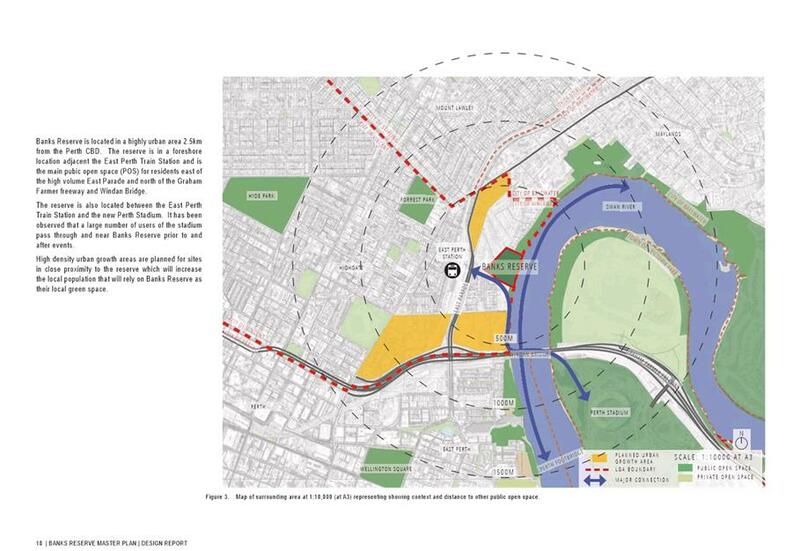 The low-level vegetation is proposed as a physical barrier to reduce conflict between dogs, cyclists and pedestrians while ensuring that sight lines and river views can still be achieved. The rumble zones may not be aggressive enough to slow cyclists so speed humps may need to be investigated. Cyclists do not have time to read signage when passing, however techniques are required to ensure they are aware when entering this shared space. Consider the cycle path should be routed to go behind the proposed toilets and cafe (away from the river) so that cyclists are not crossing where many pedestrians are walking. Since it is proposed to remove the existing building, this is the chance to redesign the area to remove the greatest problem. It is crazy having a bike path going through the active plaza. Conflicts because of the existing path alignment have previously been identified. It is a problem and will only get worse. Consideration was previously given to running the path between the building and Walters Brook, then through the car park. It was dismissed as there wasn’t enough space next to the building and it would just lead to conflicts with people coming out of the toilets. If the southern side of the building was demolished then a viable option would be to route the cycle portion of the DUP to the west of the plaza and then along Walters Brook, while allowing the pedestrians to continue through the plaza. The objective should be to provide a safe path for cyclists rather than a speedy route for commuters. Good idea to use the reclaimed bush. The three points of access between the boardwalk and walking/riding path may result in more danger rather than minimising it. Possibly widening the path in this area to allow a separate bike/walking path would be more sensible. Ensure adequate signage and/or restricting measures are implemented to reduce speed of cyclists through this area. A wider path with a clearly marked bike/walking area is a good idea. As the path is highly utilised by cyclists and such activity is encouraged, the use of speed humps is not the preferred method to reduce speeds. Path markings and rumble strips will indicate the area is a shared space and low level vegetation along the path will reduce crossing points and conflict zones. This will allow cyclists to move through the reserve while improving awareness of pedestrian activity. 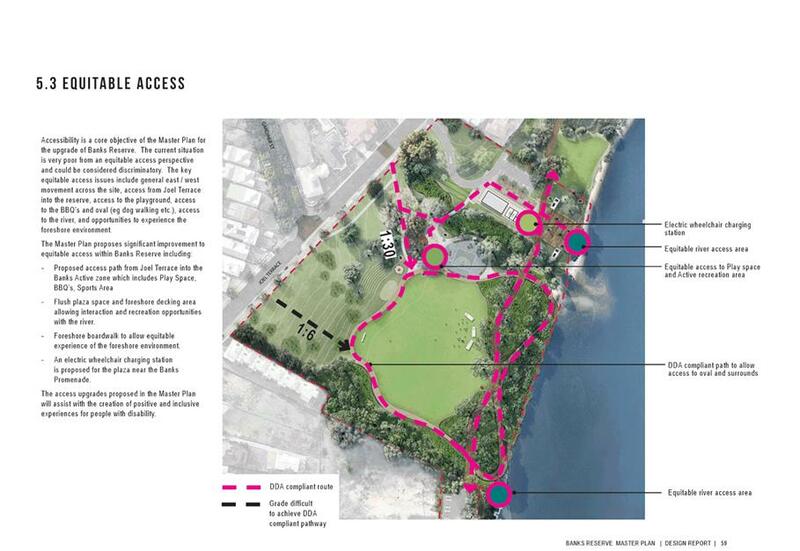 A separate pedestrian only path is proposed for around the oval. Seating options and contained areas for families/children, including BBQ’s, are required. The mini court and playground should be fenced so that dog owners can still exercise dogs without disturbing activity. The curved wall bench seating is not necessary. Individual bench seats would be a less obtrusive and cheaper option. Amenities for families and children are proposed within the Active Zone. As Banks Reserve is an approved dog exercise area the upgraded playground will be fenced. The curved seating has been included to provide both a functional element and a barrier between other reserve activities. 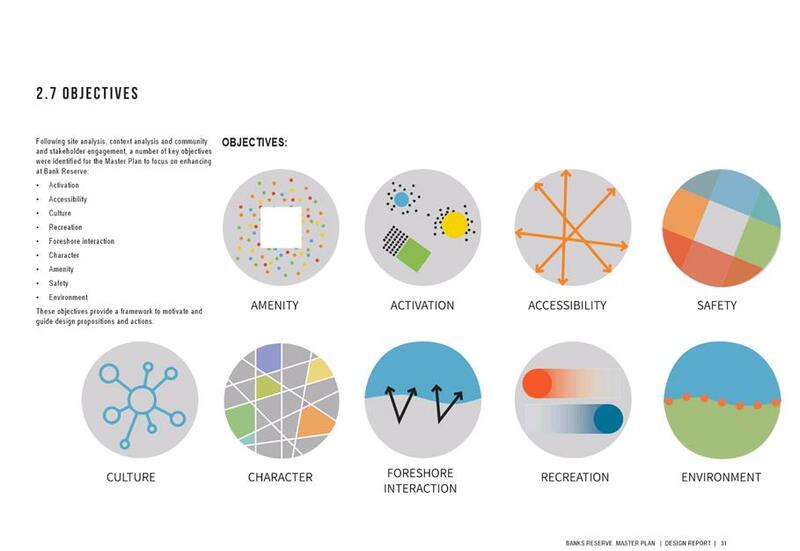 The design and cost of these elements will be further investigated during the Active Zone detailed design phase. Would like to see nature play areas like Braithwaite Park in Mount Hawthorn with wooden structures, no plastic elements, water play etc. Ensure that swings are provided and retain the roundabout as these are well used. The zone for younger children should be fenced due to the proximity to the dog exercise area. 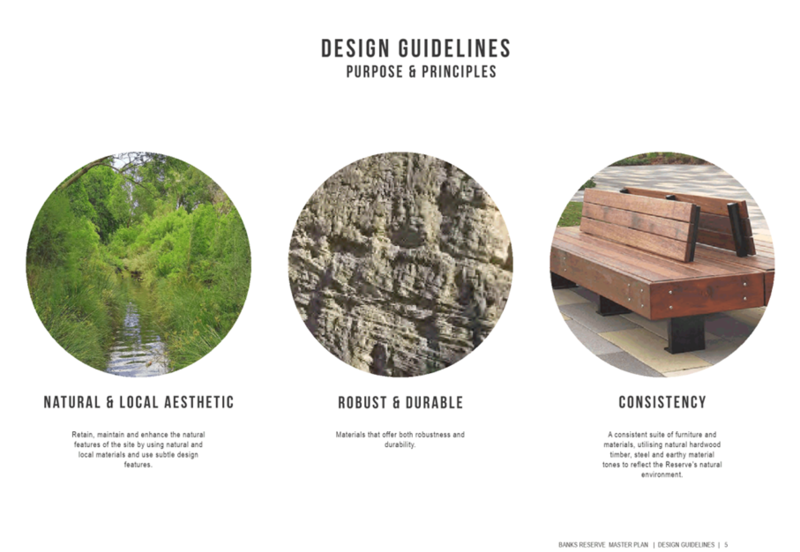 The Master Plan Design Guidelines dictate that natural elements are to be utilised within the upgraded playground. 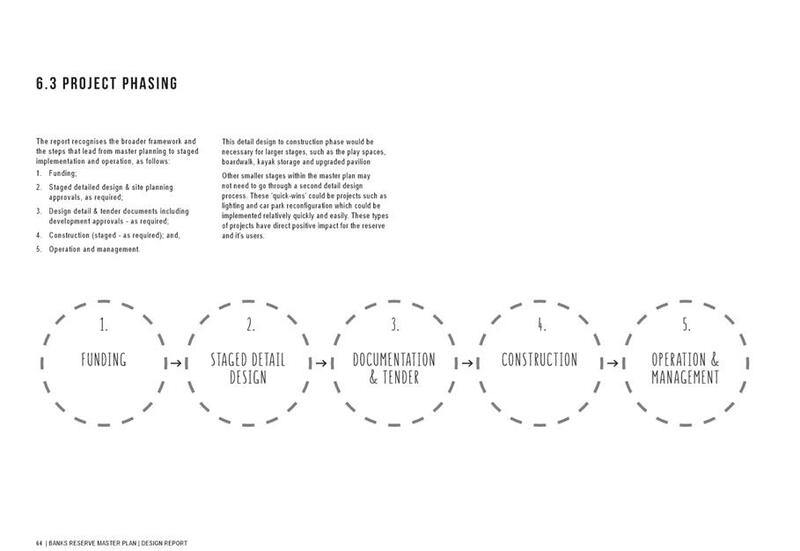 Specific play elements will be identified through the Active Zone detailed design phase. Although there is a mention of the very popular dog exercise area there are no attempts to provide a specific area of interest to dogs such as sand for digging. The need for dog specific elements was not identified during Master Plan consultation with feedback primarily relating to minimising conflict between dogs, pedestrians and cyclists. 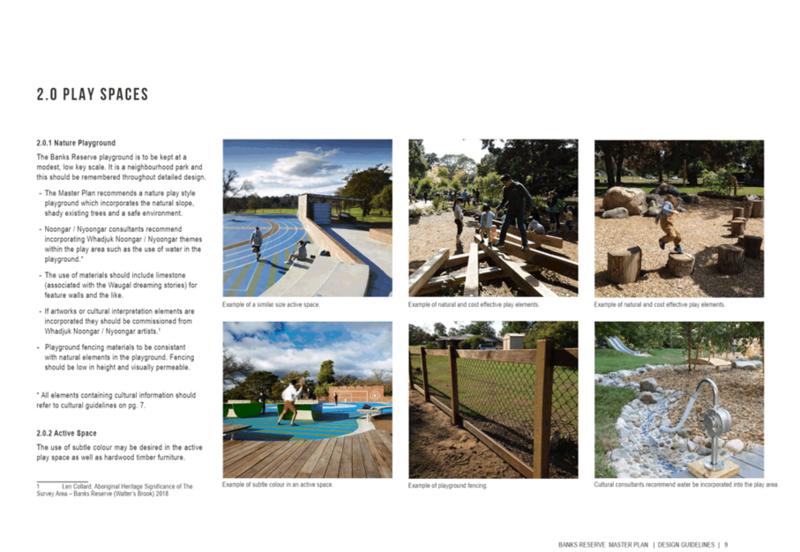 The broader Dog Exercise Strategy/Policy as identified within the City’s Public Open Space Strategy will better inform the provision of such amenities throughout Vincent. Support in general but why there is no outdoor exercise equipment. The existing equipment provides little benefit but upgraded equipment would be highly utilised. Will the adult exercise equipment be returned/upgraded as this is well used and is an important and practical application for the health/wellbeing of the community. Upon investigating the quality, capital and maintenance costs and relatively low usage of the outdoor exercise equipment it was decided not to include any upgrades within the Master Plan. 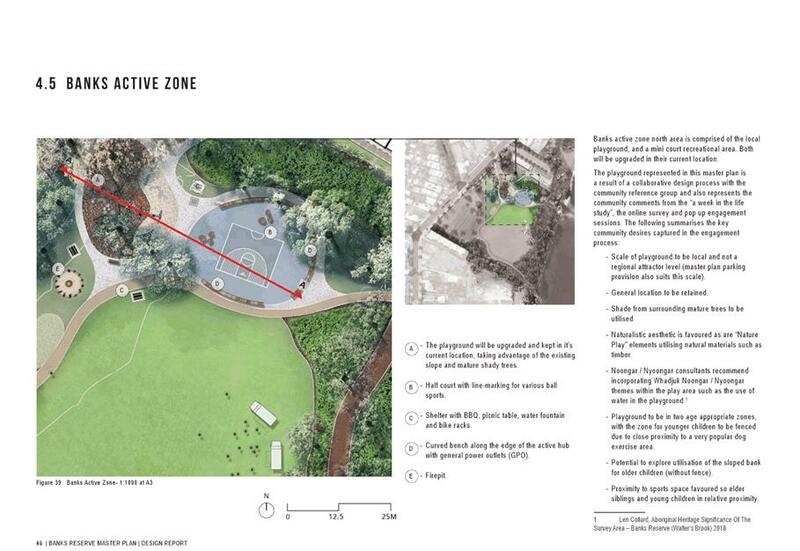 As an alternative, other recreational opportunities including the mini court are proposed within the Active Zone. The oval path will provide an area for riding of bikes and scooters that will create conflict with dogs/dog owners. Adequate east west access across the site is already provided. 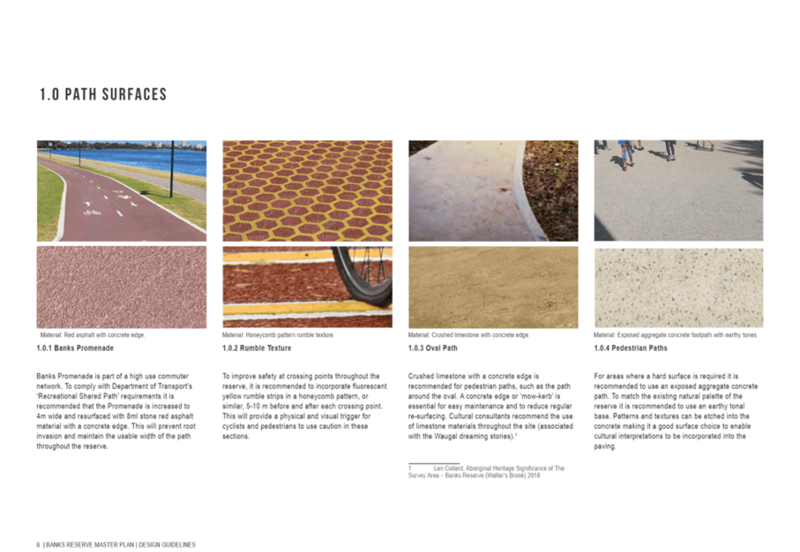 The concrete pathway will only cause additional heat areas, reduce park usage for sporting activities and dog walking/play areas. The oval path reduces the size of the oval – high cost for no gain. It will interfere with the use of the goal posts and people running up and down the reserve slope. 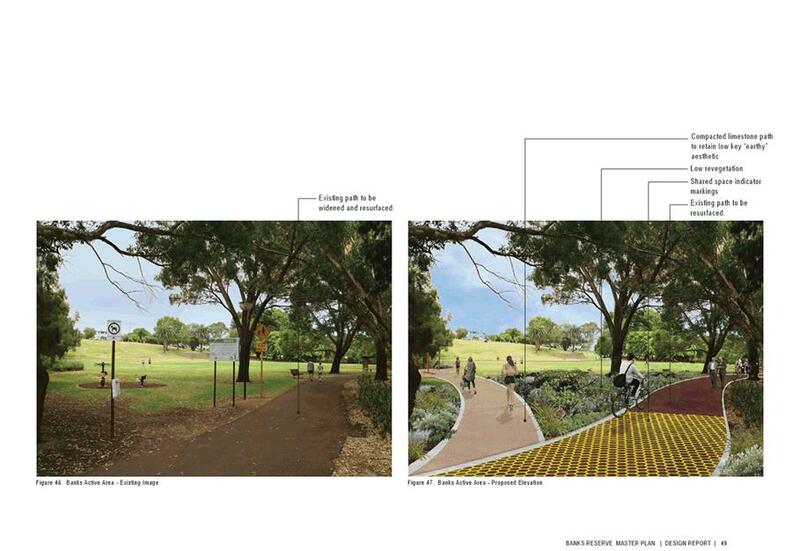 The path would diminish the serviceable area of grass and dissect the park from its bushland fringe. The Reserve is not large enough for this to be practical. There are drainage issues on the oval. Landscaping in general terms is supported with grass surfaces being managed to a higher horticultural and drainage standard. Concern the limestone path will limit the use of the bank. Space is lost for dog activity. I don't see the benefit of creating a track around the outside of the oval as it will reduce the grass area without adding any functionality. 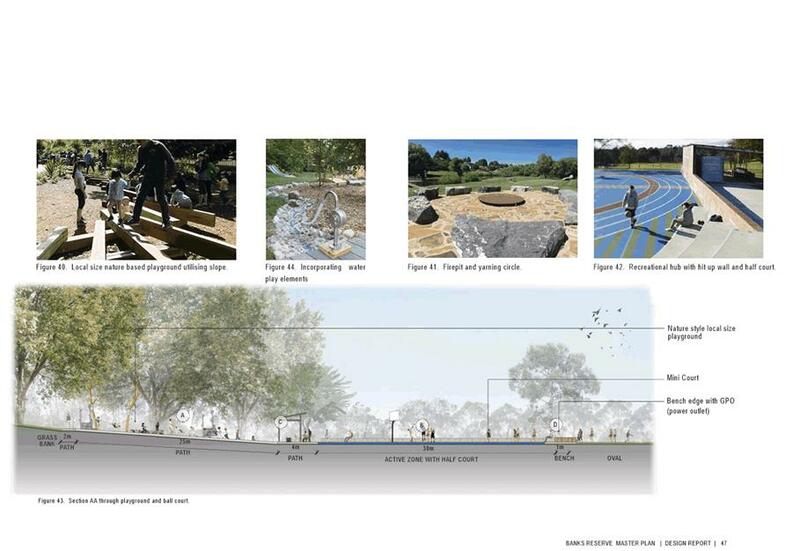 The proposed oval path within the Active Zone is compacted limestone and purposefully designed for walking. The path directly responds to community feedback regarding conflict between pedestrian and cyclists and the need for a pedestrian only option. 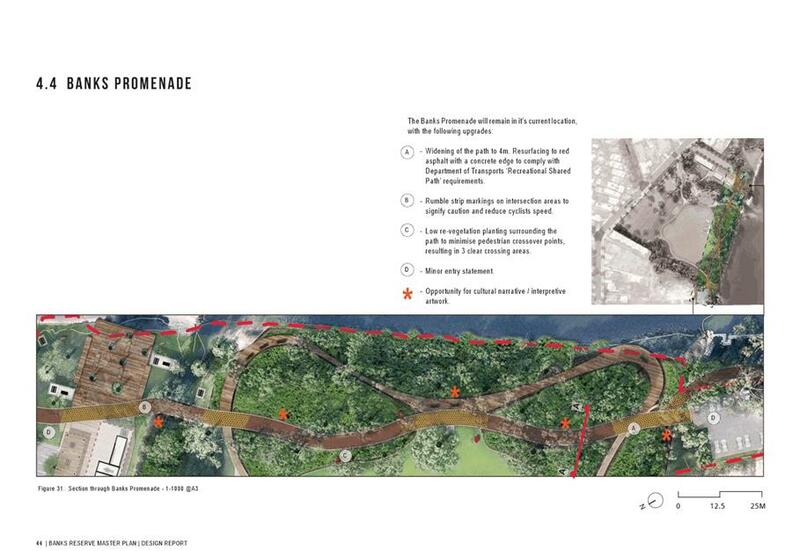 The primary purpose of the path is a recreational circuit for pedestrians that links to the Banks Boardwalk. A large, open grassed area has been retained to enable passive, unstructured recreation activities and dog exercise. The area identified as being prone to flooding and poor drainage has been identified for eco-zoning. There is no mention of an off leash dog walking and play area. This is currently a major use pattern of the oval and we are disappointed that there has been no allowance made for dog owners to exercise their dogs. I note that there is no specific acknowledgement that Banks Reserve is a dog off lead park. It is important that it remain such. This park is widely known as a dog exercise park. It is regularly used by hundreds of dog owners both local and visitors. Will there be dog facilities? 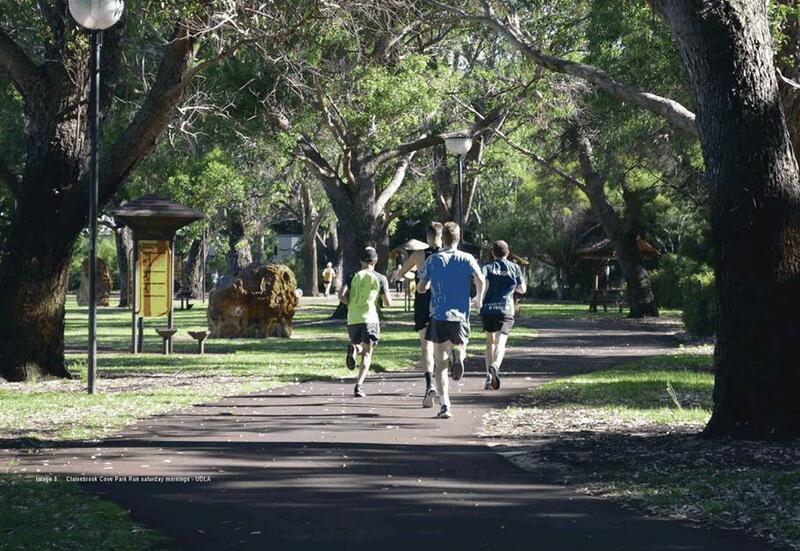 Banks Reserve will be maintained as a dog exercise area. The need for dog specific elements was not identified during Master Plan consultation with feedback primarily relating to minimising conflict between dogs, pedestrians and cyclists. 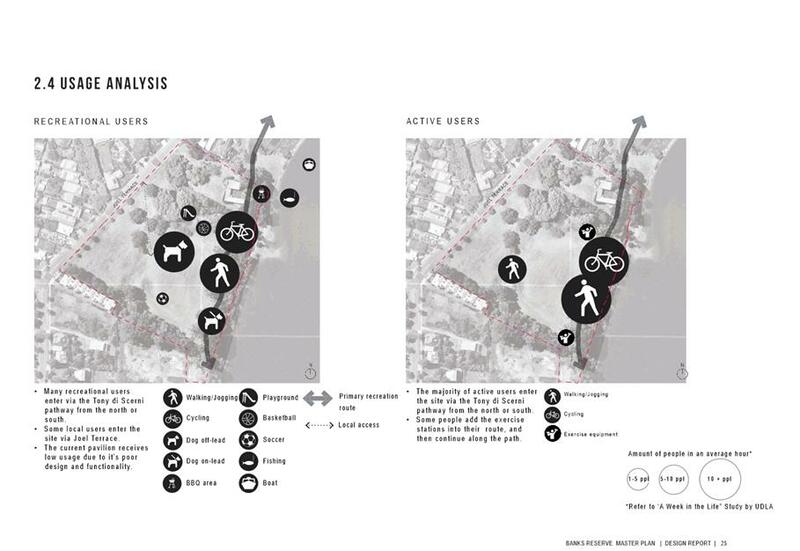 The broader Dog Exercise Strategy/Policy as identified within the Public Open Space Strategy will better inform the provision of such amenities throughout Vincent. The removal of cricket nets and replacement with a basketball court will disadvantage children in the area. There is a full sized basketball court in Claisebrook Cove. Tennis hit-up wall and volleyball posts should be included in the active recreation spaces. The current basketball facility for shooting hoops is popular with children of all ages as it is not at full height. The intensity and space required for the Active Zone is of concern. There is limited space in this location for the basketball court. Please limit hard surfaces which may have a negative impact on tree roots. Looks good. It looks like the cricket nets are gone? There are basketball courts available for use less than a 3 minute drive away at Claisebrook cove, which hardly gets used. 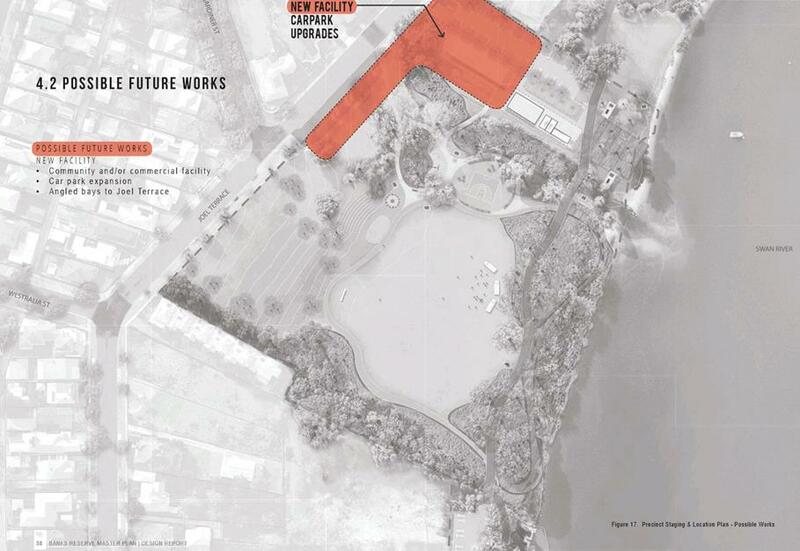 A basketball area already exists at Banks Reserve and the Master Plan identifies the opportunity to convert this to a multi-purpose mini court that can accommodate a broader range of modified, recreational activities. The recently completed Public Open Space Strategy has identified a significant gap in the provision of recreational infrastructure for children and young people. Access for food trucks and other vehicles for events appears restricted due to revegetation at reserve entry points. Specific vehicle access requirements will be further considered and refined during the Active Zone and Banks Plaza detailed design phase. The impact of 8,600 people from events is grossly exaggerated as most of the Optus Stadium users travel directly from the Windan Bridge to East Perth Station or up Summers Street. Very few people will use the path to cross the reserve when they can walk diagonally. The pedestrian statistics have been sourced from the Public Transport Authority and it is acknowledged that many of these pedestrians will not necessarily access Banks Reserve. Although there remains an opportunity to provide pop-up activities on Optus Stadium event days to activate the Reserve. Remove the fire pit as it will only encourage anti-social behaviour late at night. Preference would be for a BBQ and seating area. The fire pit is a vandalism risk and the obscured area outweighs benefits. It presents a fire risk to the adjacent rubberized play area and natural foliage. Fire pit is a waste of space. They are banned for safety reasons. Is a fire pit feasible? It would be better to call it a talking circle rather than raise expectations that people can come along and have open fires. I’m concerned about the ongoing use and safety and maintenance of the planned fire pit. 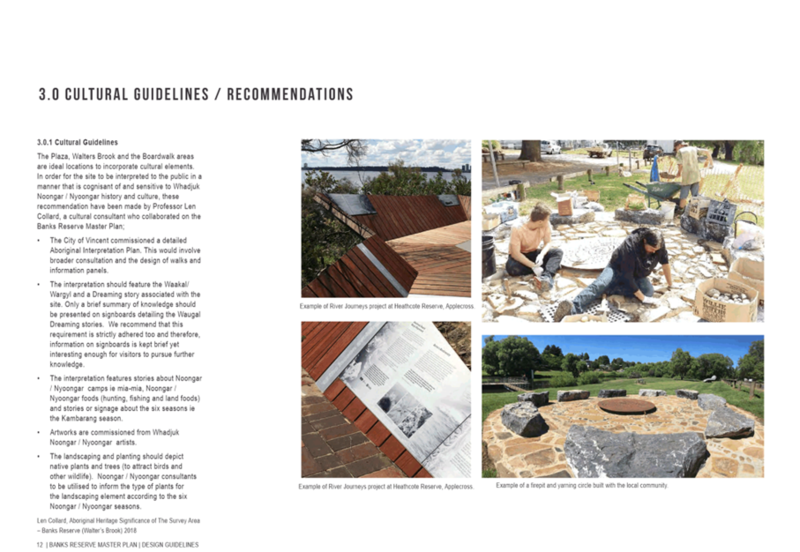 Administration has investigated designs that allow the fire pit to be effectively managed and locked when not in use prior to inclusion within the Master Plan. More proposed desecration of a renewed natural environment that has been beautifully enhanced by recent planting. The bridge structure is unnecessary, a waste of money and would break up the replanted natural vegetation around the brook. The peaceful seclusion would be lost as with the bridge the brook becomes an annex of the car park. The Walter’s Brook crossing is unnecessary and will damage the regenerated vegetation. Create nature learning area on Walter's Brook. It is important that activities consider all members of the community. Will it lose some of its appeal and go back to being a drain again? Good to see the waterway cared for as well as pedestrians. Extra bridge is a good idea. Great work. Support artwork, interpretive/culture story telling. The current bridge serves its purpose perfectly well. While the revegetation of the edges of Walters Brook are likely to provide some phytoremediation (Administration – technique using living plants to clean up air, soil and water) as mentioned in the report, it is limited due to the brook being quite straight through this section. If a small loop could be created, through which water would flow during low-flow conditions, with a straight-through path for high-flow conditions, not only would phytoremediation be increased, but this could also provide an interesting area for nature learning within the active zone. May be worth considering changing course of brook to slow the flow, to improve effects of planting. A beautiful living stream well designed and looked after a credit to the City of Vincent. I support the small bridge – easier access to toilets and reducing cyclist/pedestrian conflict. Good idea to create a second (pedestrian only - not for cyclists) crossing point. 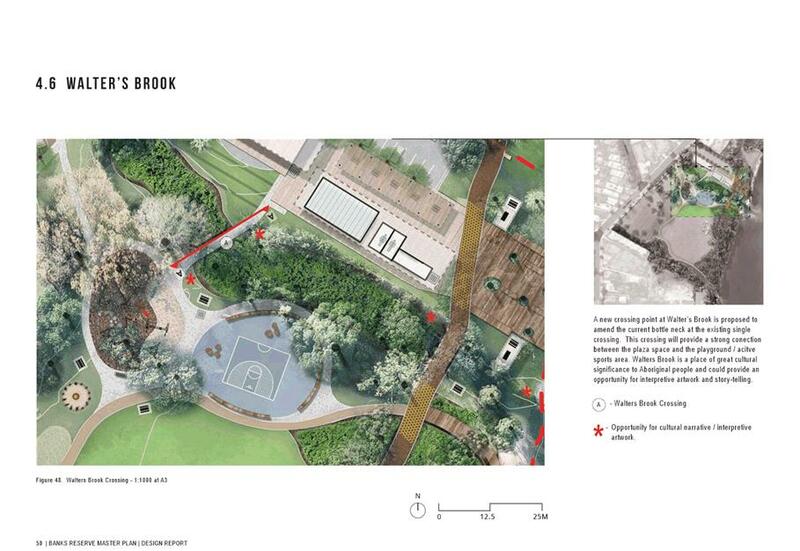 The new crossing point at Walter's Brook is proposed to alleviate the current bottleneck at the existing crossing and provide a connection between the Banks Plaza and Banks Active Zone. A number of safety concerns associated with toilet access and poor sight lines were highlighted during Master Plan consultation. The bridge will assist with addressing these issues. Consultation with the Department of Biodiversity, Conservation and Attractions (River and Estuaries Division) during the detailed design phase will ensure necessary consideration and mitigation of any flora and fauna impacts in addition to engagement and learning opportunities. Will damage the regenerated vegetation that has taken years to grow. Preservation of the riverine environment is important to limit disturbance to flora and fauna. The length of the boardwalk along the foreshore will be invasive. 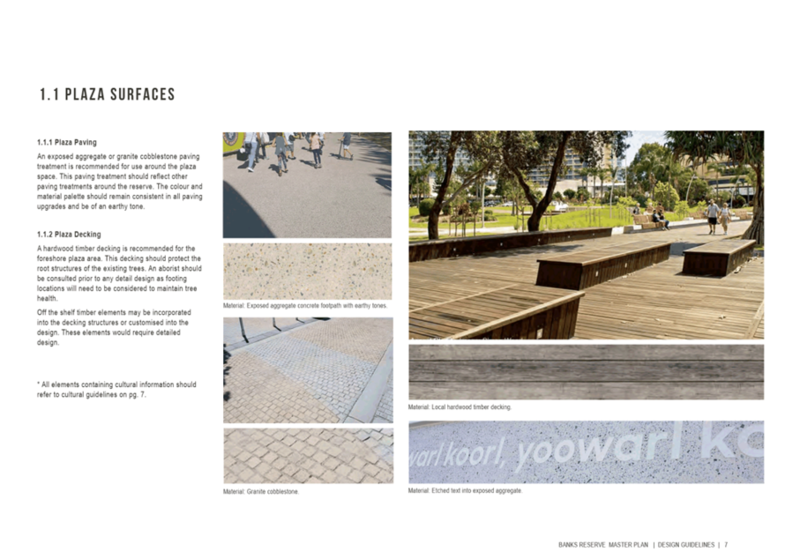 The boardwalk will encourage people going to the foreshore but some areas along the foreshore could be protected for water birds and other native fauna, minimising potential impacts from human usage. Improved river views are unnecessary as the path along the river gives plenty of river views. Consideration must be given to wildlife. Is this going to be an asset that is expensive and difficult to maintain. Why build an extra path next to the current path through vegetation, which helps frame the entire area. While a boardwalk will provide controlled access through the revegetation areas, I have some concerns that it may result in people (and particularly dogs) accessing the area, by leaving the boardwalk, and damaging the vegetation and disturbing wildlife. Don't destroy the trees, birds, artefacts that are living peacefully. Ensure no damage to plantings. Access to plants and water is the main attractor for this park. Good to see them so thoughtfully celebrated in this plan. Excellent use of raised deck to protect trees and make the water’s edge more accessible. 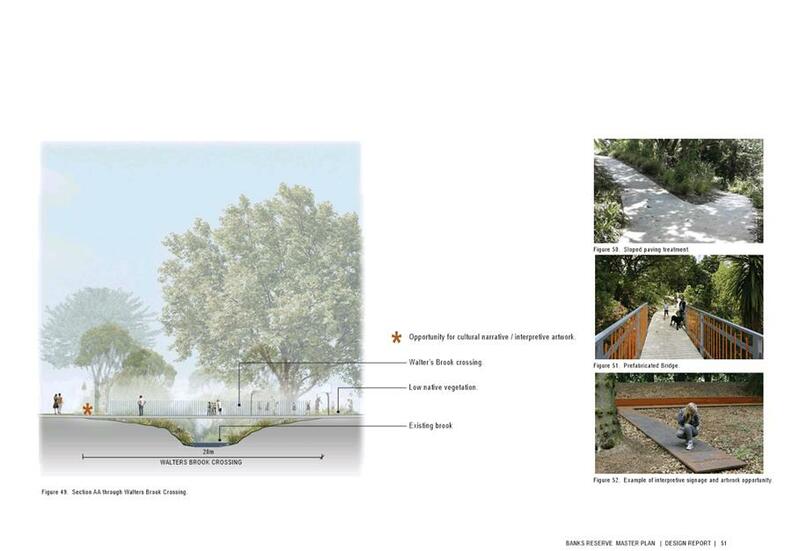 The Master Plan aims to strike a balance between protecting vegetation while providing improved access and interaction with the river. Community feedback received during preparation of the Master Plan identified the riverside location and features to enhance interaction with the river as a major opportunity. Consultation with the Department of Biodiversity, Conservation and Attractions (River and Estuaries Division) during the detailed design phase will ensure necessary consideration and mitigation of any flora and fauna impacts. As part of this detailed design, the City will ensure a flora and fauna survey is completed in conjunction with the Department of Biodiversity, Conversation and Attractions, which will inform detailed design, in addition to providing education and awareness opportunities. The City will consider maintenance and repair costs during detailed design and the selection of materials. Areas to easily launch kayaks, stand-up paddleboards etc. and more areas for picnics where children can access the river are supported. There is no specific mention of river access via a sandy beach so that kids/dogs can play. Worried about access to the beach and river. 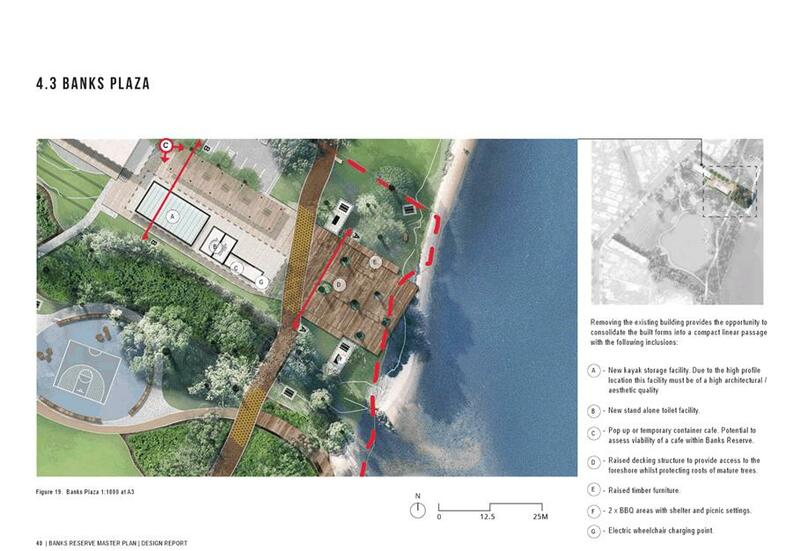 Looks good, must retain beach area as much as possible - for kayaking, wadding etc. Access to the beach area for kayaks is important. Good idea, as long as beach area is not affected. 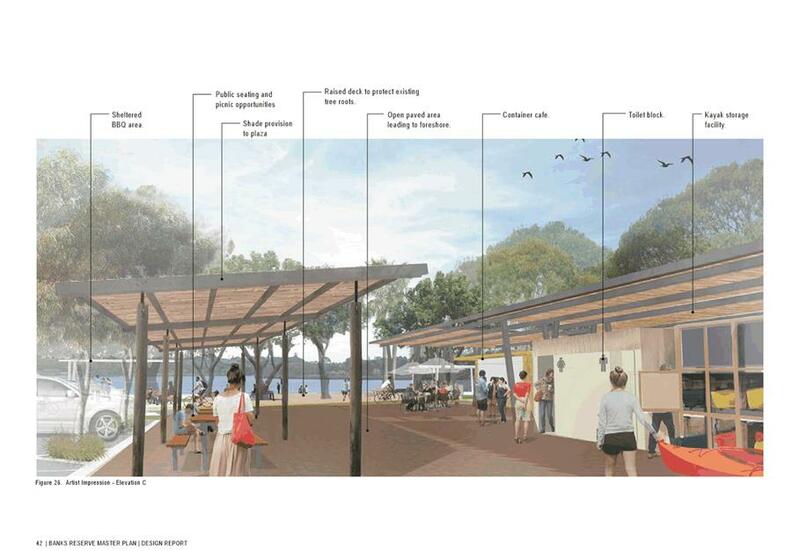 The small, existing beach area on the foreshore is to be retained and both the Banks Plaza and Boardwalk Zones aim to enhance accessibility to the river. Additional amenities for families and children are also proposed within the Banks Plaza and Active Zones. Concerned about the boardwalk surface as the steel mentioned will have holes which may negatively impact dog claws and paws. 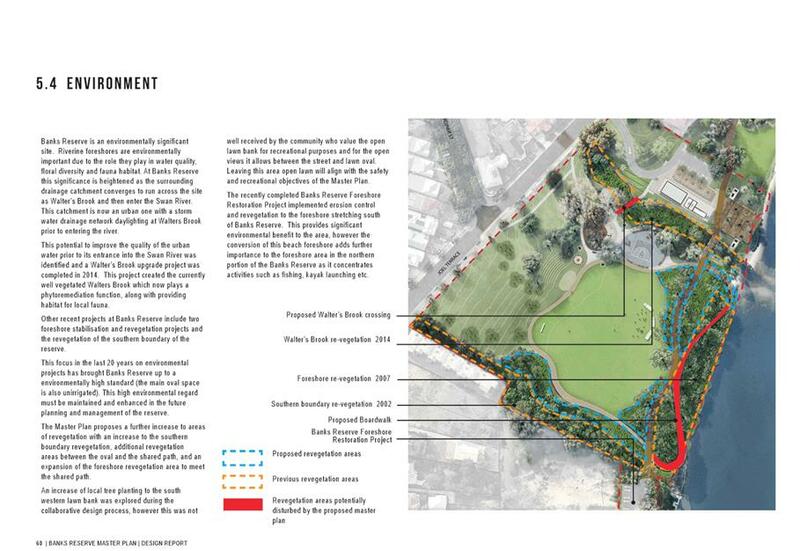 The boardwalk remains subject to a detailed design phase and this concern has been noted for consideration given that Banks Reserve is a designated dog exercise area. Due to the number of people that fish here another extension to the river from the centre/crossing point of 'the bow' is preferable. 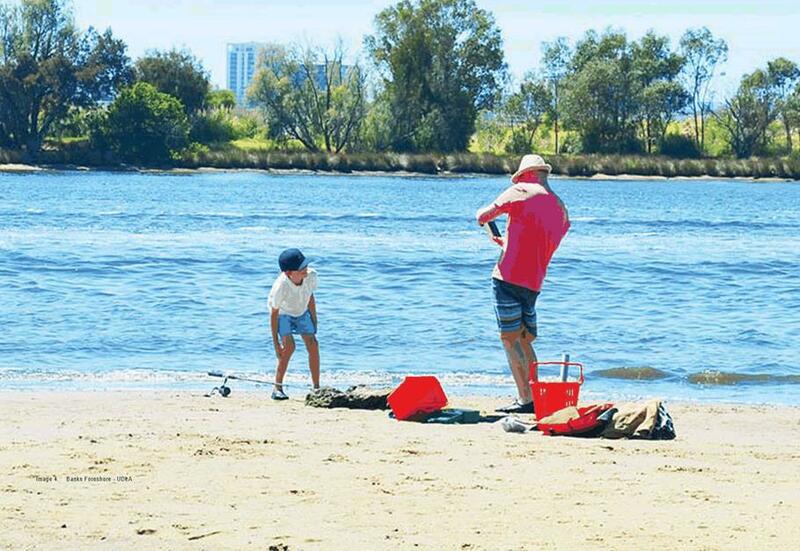 By providing fishing spots it encourages people to look after the river. This opportunity has not yet been captured within the Master Plan but aligns with the intent to improve access and interaction with the river. 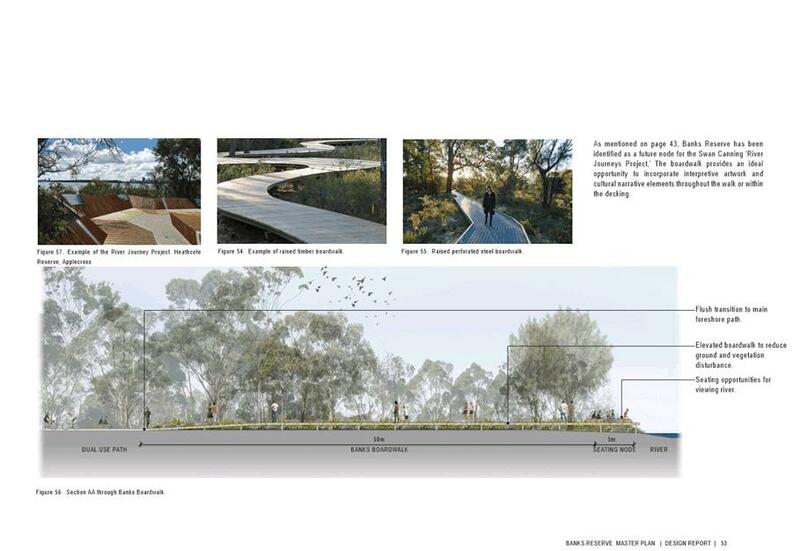 This concept will be further investigated with the Department of Biodiversity, Conservation and Attractions (River and Estuaries Division) during the Banks Boardwalk detailed design phase. 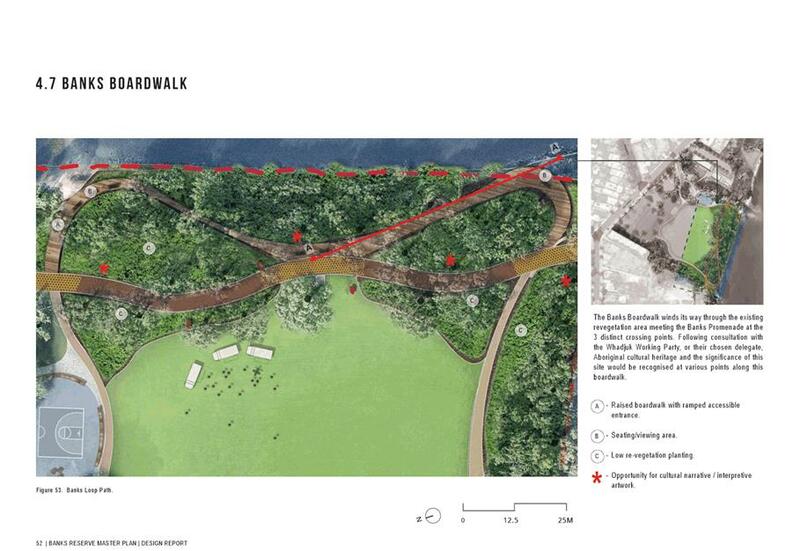 Supportive of the boardwalk if people can walk through the area without compacting the ground. Existing amenity should still be maintained for cyclists. Pedestrians and bikes should be separated like in South Perth and Victoria Park. These arrangements work really well and there is nothing like that north of the river. Multiple options to manage conflict between pedestrians and cyclists have been investigated during preparation of the Master Plan, including advice from the Department of Transport. 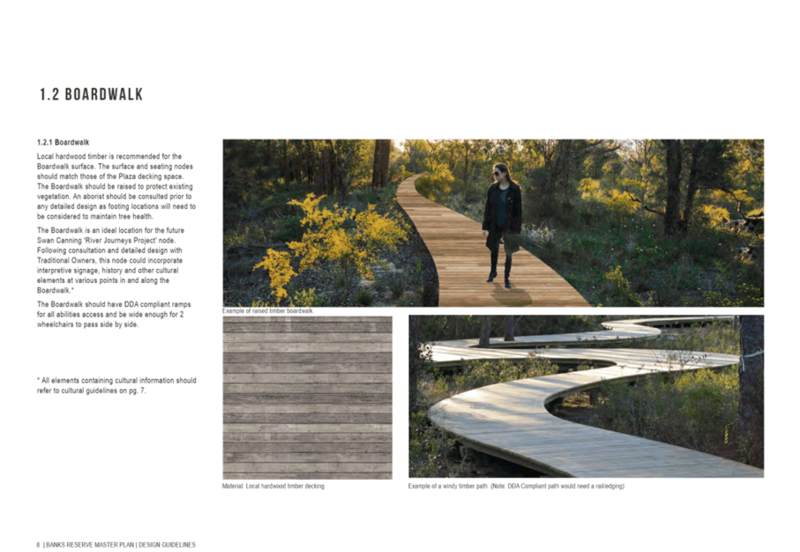 Key design elements and options for the boardwalk and paths will be further investigated through the detailed design phase upon adoption of the Master Plan. Not planting out the bank area and along Joel Terrace seems a missed opportunity to replace the existing ugly fence. The opportunity has been missed to revegetate areas of the western bank with low-growing local species and some additional trees. Sometimes the wider benefits of beauty and biodiversity need to be considered over the loss of views for a small number of properties. During preparation of the Master Plan local residents identified the importance of keeping the top of the reserve open to improve passive surveillance. Soccer and/or football goals posts should be installed. The soccer goal will be retained. Further sporting infrastructure has not been included in the Master Plan as there is a focus on spaces and amenities to support passive recreation activities. A set of stairs or path leading up to Westralia Street from the southern side of the bank to provide access towards East Perth station should be included. Better access from the road would be good, possibly down one side of the bank. Additional access points were investigated during preparation of the Master Plan, however the steep gradient would require a significant infrastructure solution. A pathway from Joel Terrace near the playground is preferred due to the more gradual incline. The soccer goals are well utilised but will be negatively impacted by the oval path. Barriers may be required so that cyclists, walkers and joggers are not hit with balls. The goals with the hill behind work well so the ball rolls back. The soccer goals will be retained, however at the time of the oval path construction they may be relocated or redesigned if the current location causes conflict. Unnecessary waste of money and will impact residents overlooking park. The new facility should not be on Joel Terrace. It would be better placed at the Summers Street end, as would the plaza. The location of the new facility will require more discussion with the community. The existing building should be retained and renovated as it has potential for use by a broad section of the community. Would rather keep the existing building as I am concerned that ‘next steps’ will not happen and we will have lost a facility that has the potential to be used for a variety of community purposes. Why demolish building (2021) prior to a new facility feasibility plan (2022) – refurbishment is preferred over replacement. The existing facility is patronised by a Montessori playschool, yoga classes and other community meetings. It is a valued community facility. Contrary to the comments in the Master Plan the present facility is very well utilised. Small community halls unattached to religious institutions are rare in Vincent and need to be preserved. We are concerned about noise, intensity and activities to be generated from this new facility. The new facility opportunity remains subject to future feasibility and business case investigations, and envisaged to be a potential future stage of the Master Plan. Feedback received during preparation of the Master Plan highlighted that the current facility design, location and condition did not meet community needs. The building does not comply with current accessibility and compliance standards and is nearing the end of its useful asset life. Facility usage statistics demonstrate limited utilisation. Great concept but am concerned about the extended car parking. Far better to have more parking on the Summer Street side of the Reserve rather than removing trees and having a car dominated entrance. There is a lot of public transport servicing the area so this should be encouraged rather than additional car parking areas. Mature trees should not be lost for additional car parking. More parking is not required. There is plenty of parking at both ends of the reserve and on Joel Terrace. Parking provision is currently sufficient except for during major events. Additional parking and lighting on Joel Terrace will negatively impact adjacent residents. This will ruin the quiet, simple ambience enjoyed by all visitors to the reserve. High-level lighting will not discourage vandalism or any other criminal activity as those who are inclined to undertake anti-social behaviour would find it more convenient. If a community/commercial facility is built later then that is the time to consider parking. This is particularly relevant as there is no certainty about such a facility. It was my understanding that the placing of the car park adjacent to the residences if it was to occur at all was in a very late stage of the redevelopment programme. I have concerns about increased lighting and the impact on diurnal/nocturnal animals in this natural area. The new facility opportunity, including the associated car parking, remains subject to future feasibility and business case investigations and envisaged to be a potential future stage of the Master Plan. Feedback received during preparation of the Master Plan highlighted safety concerns, and provided the basis for improved lighting. Lighting locations and times will consider the proximity of adjacent residences. Angled parking on the eastern side of Joel Terrace is not supported as it encroaches into the Reserve. The area is routinely used for commuter parking. Any additional parking associated with the new facility opportunity is intended to be located on the edge of reserve, including Joel Terrace, rather than within the reserve. On-street parking occupancy directly informs the need for any parking restrictions in response to commuter parking. The bulk of the works should be undertaken simultaneously as conducting works over several years will just prolong the inconvenience to users. The kayak storage and pop-up container café should be brought forward if possible. The first priority should be to replace the outdated building/toilets with a new building comprising a community hall, toilets and café. This should be located next to the Summers Street car park. The high priority implementation steps will not add much to the Reserve. It seems ridiculous to demolish the current hall and toilets before having funds to replace them with a new structure. 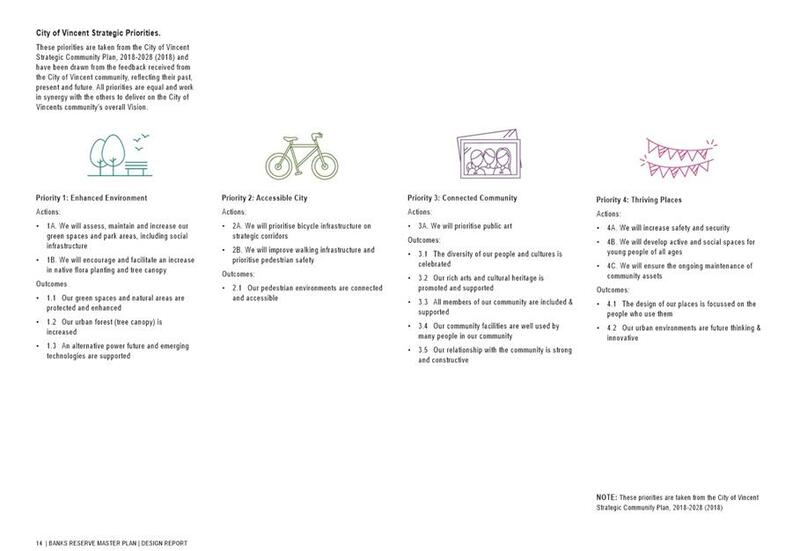 The recreational shared path should be identified as a high priority issue within the Master Plan. 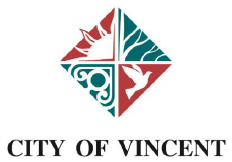 The City of Vincent may wish to commence a staged development and then after the first stage to hold some further consultation with the local community and to ask their response to the redevelopment and what they would like to see happen next. Master Plan implementation remains subject to consideration within the City’s annual budget process and Long Term Financial Plan. Implementation priorities have been determined based upon a combination of current asset condition, community priorities and practical staging. 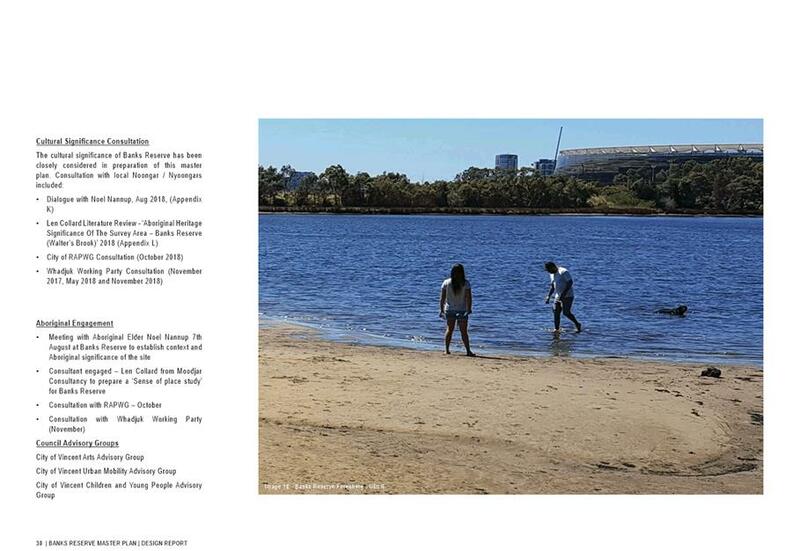 Not sure how the Plan relates to Noongar history. The Reserve has always attracted Aboriginal people. There is a need to retain and strengthen that and do our bit for reconciliation. 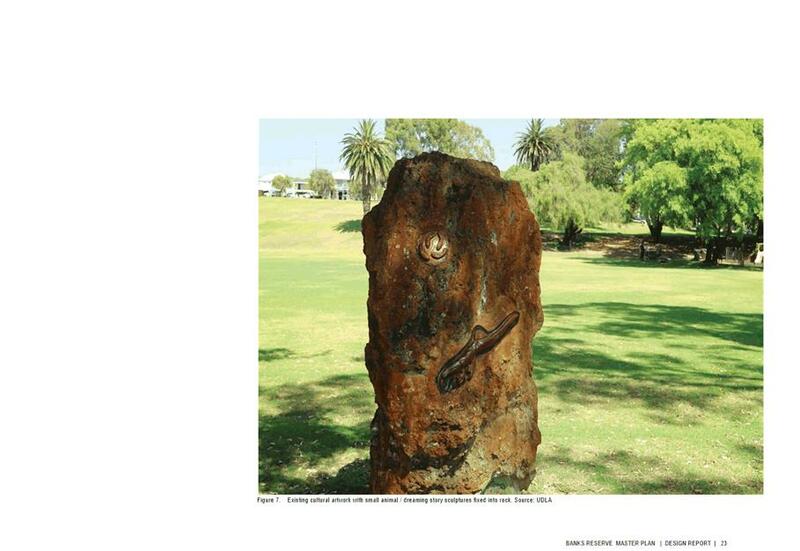 Keep the serenity of what Reconciliation Park means to all cultures including the Noongar current symbols. A comprehensive analysis of the reserve has been undertaken to reaffirm its cultural significance and directly inform the Master Plan elements. This has included consultation with Noongar Elders and the Whadjuk Working Party, and that dialogue will continue through the implementation phase. Allocate funds to upgrade the Summers Street jetty. It has always been well utilised and it’s sad to see its degradation and closure. Funds could be better used for restoration of the two jetties within the Banks Precinct. 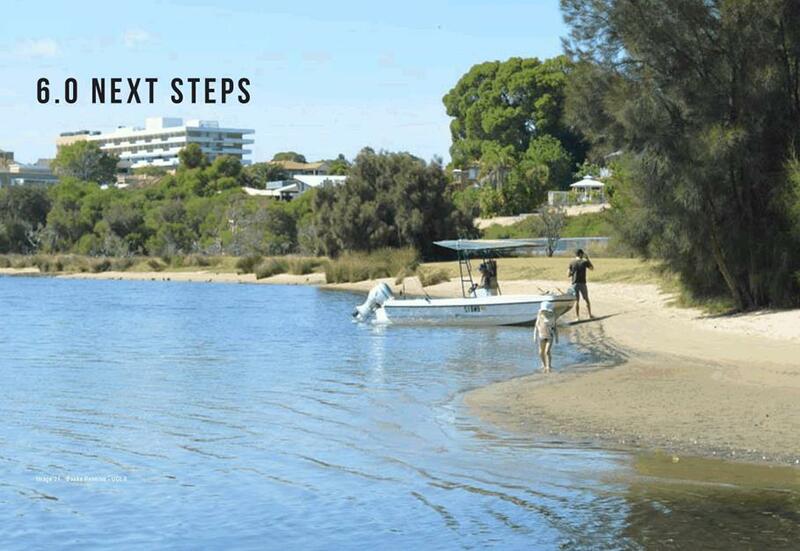 The jetty closure has strengthened the importance of providing opportunities for the community to interact with the river and this is a key focus within the Master Plan. Reconstruction and reopening of the jetty remains subject to the City’s annual budget review process and consideration of community benefits. Do not change the name of the Reserve. People who live around the park should have some say on what it should be called. I strongly object to changing the name, particularly when it is suggested to change it to some made up name that could be just as relevant to a large number of sites along either of the metropolitan rivers. Do not understand why the name "Warndoolier" was not the recommended name for this park. It is the name shown on old maps, and I consider it provides the greatest "sense of place" as that name refers to this area and nowhere else. The park should be co-named rather than re-write history and abandon more recent history. I'm delighted to see the Whadjuk Working Party and Aboriginal elders involved in this process. 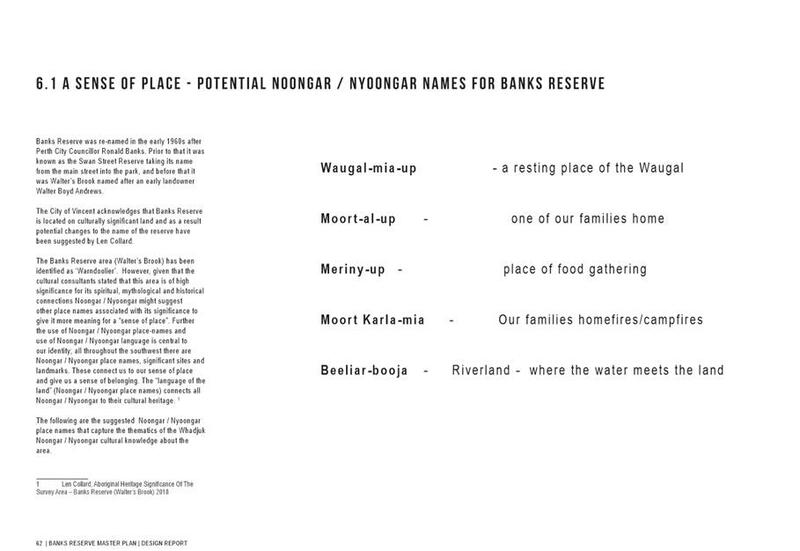 I'd be very happy to see Banks Reserve renamed, or once again named, in Noongar language. Any renaming or co-naming of the Reserve will remain subject to a separate process as per the various policies and standards for geographical naming in Western Australia. Community consultation is an essential part of that process. Money would be better spent on finding a use for the East Perth Power Station. 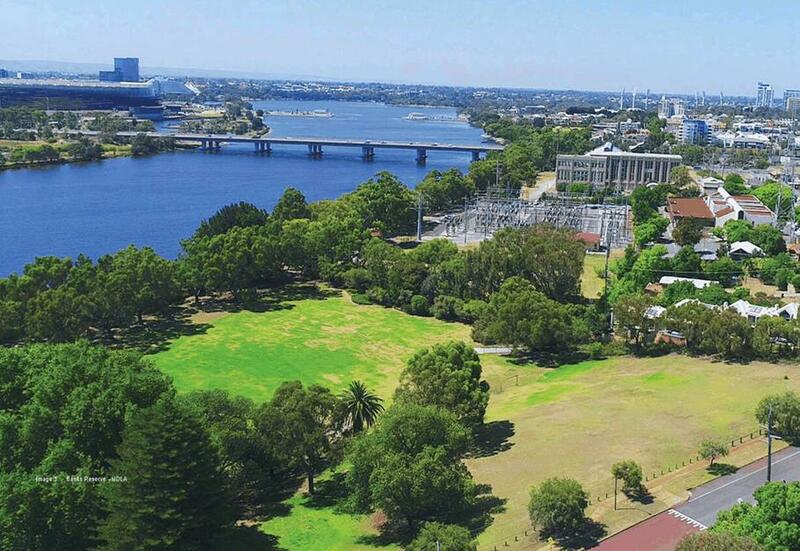 Should the Power Station be used for residential development it would be appropriate for the City of Vincent to advocate that some of the site be used for community space and public open space to reduce pressure on Banks Reserve. Future Aboriginal aspects should not be committed to until the Power Station use is known as it may be a double up. The East Perth Power Station site is controlled by the State Government. Both the Metropolitan Redevelopment Authority and Western Power were consulted during preparation of the Master Plan and there are currently no confirmed development plans or timelines for the site. Money should not be allocated for a rehash of a park that local residents want to keep the same. A few upgrades are required but nobody wants to see this beautiful, natural park turned into an amusement/tourist drive in, drive out venue. There seems to be an opinion that the current Banks Reserve is underutilized and these new modifications will enhance and improve the reserve. As a daily user of the Reserve I am not of that opinion and feel efforts should be made to retain as much of the natural environment as possible. This park is beautiful and peaceful and residents and visitors appreciate it for these attributes. There is no need to shrink the green space. The Plan appears too controlled resulting in very high maintenance costs for the City. Less is better. Trying to cram everything in would change the nature of the park. Councillors should visit the park to understand current use – it is a meeting place for those who often have very little social interaction. 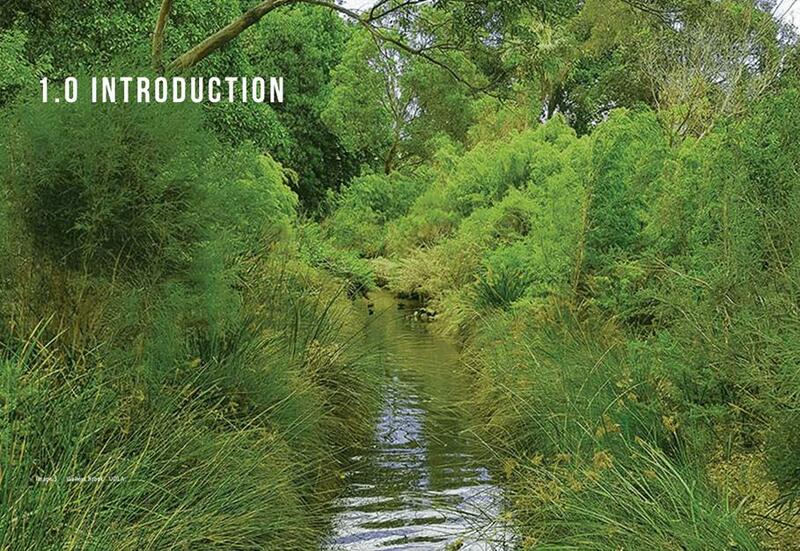 Banks Reserve is a unique place because of its simple, understated ambience that results from minimalist man-made structures and fantastic revegetation efforts that have rejuvenated the foreshore and the brook. The dog park is a magnet that brings a range of people together from within and outside the Vincent community and fosters these relationships. The proposed changes in the Master Plan will only damage not enhance the way the reserve is used and loved by locals. It would create another dimension right in the opposite direction than the peace and reconciliation intent. I don’t see the requirement for urbanising an area that has a natural enjoyable beauty. I love the proposal. I think I would enjoy this place more if the Master Plan is realised. Generally happy with the desired outcomes, support better lighting and equitable access. Banks Reserve serves a wonderful purpose in its current format. Yes it could do with some sprucing up but not to the extreme level proposed. 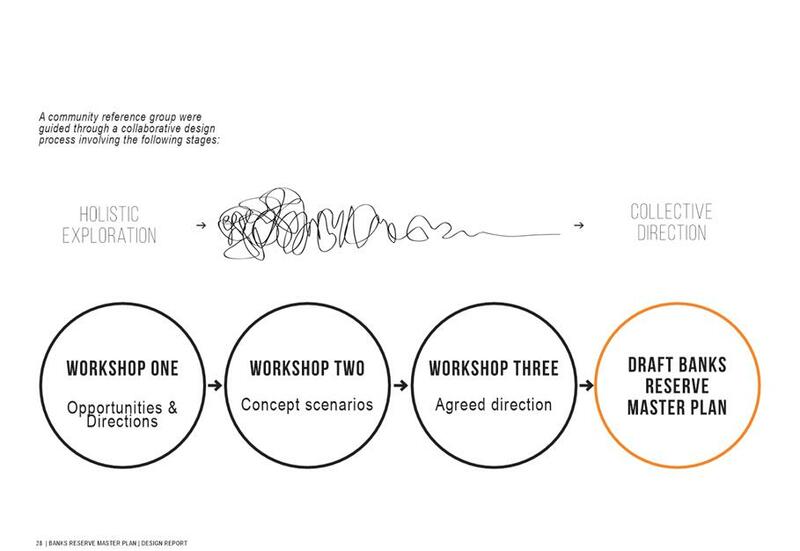 The design team have done a great job with this proposal, please keep them leading the next steps. Good to have a mid and long term plan. The Master Plan provides a coherent and coordinated vison to guide the future development and management of Banks Reserve. It has been prepared based upon the range of ideas, views and comments provided through community consultation. 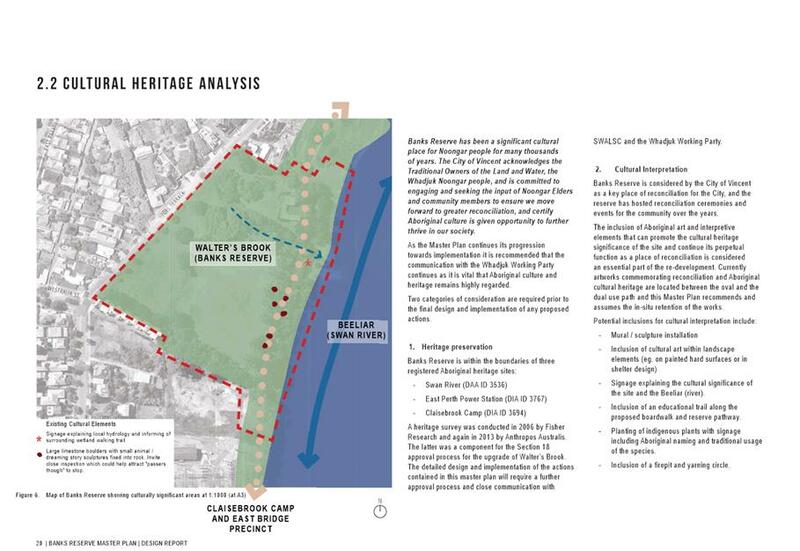 The consultation process included surveys, workshops, pop-ups at community events, meetings with key stakeholder groups, onsite analysis of reserve usage and site and cultural significance analysis. All feedback was considered and incorporated where possible and practical, however such projects always attract a wide range of views. The plan is silent in terms of the ongoing problem with traffic on Joel Terrace. The number of cars and speed of traffic must be addressed before increased use of Banks Reserve is encouraged. Traffic and car parking concerns have been noted and will be investigated further as part of the City’s Integrated Transport Strategy in 2018/19 and 2019/20. The Master Plan recognises that Banks Reserve is a significant site for Aboriginal people, and has consulted with Noongar Elders and the Whadjuk Working Party. The Master Plan aims to achieve improved amenity and functionality while retaining natural features and environmental assets. The Plan does not estimate operational costs after development and what kind of maintenance standard will be provided. The City’s Asset Management and Parks Teams have been involved throughout the Master Plan process. Maintenance implications and life-cycle costs will inform decision making during the subsequent detailed design phases. It is acknowledged that effective asset management and maintenance of the Reserve remains an important City responsibility. More parking would be better along the switchyard off Summers Street. The Summers Street car park is often flooded so should be a priority for drainage works and resurfacing. Summers Street car park should be improved to reduce traffic into the park and maintain the concept of open space. The Summers Street parking area should retain river access for people wanting to launch kayaks at that end of the reserve. 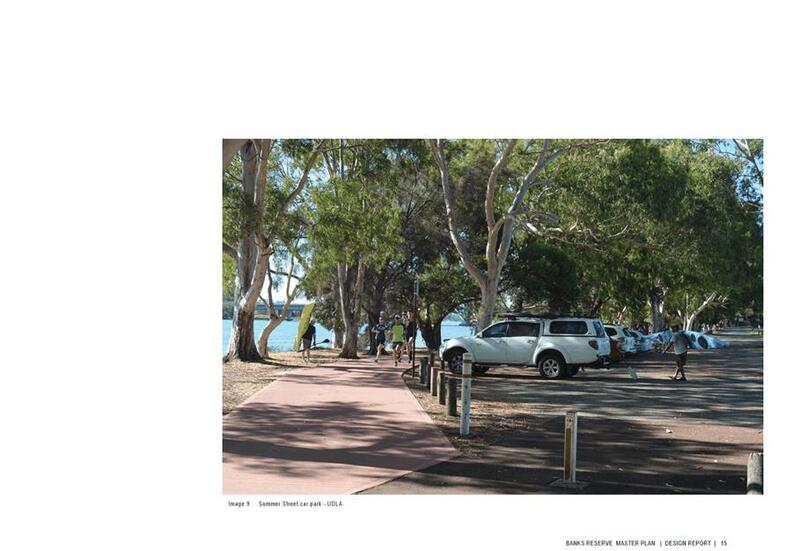 The Summer Street car park is essential to support Banks Reserve and the river foreshore generally. Upgrades have been identified as a high priority with funding included in the City’s 2018/19 capital works budget. All those who provided Master Plan feedback (and provided contact details), including those who attended Public Question Time at the Ordinary Council Meeting on 11 December 2018, have been advised that the matter is being considered at the Council Briefing Session on 26 February 2019 and Ordinary Council Meeting on 5 March 2019. The Draft Banks Reserve Master Plan was presented to the Working Party on 21 November 2018 and no major concerns or comments were put forward. The key outcome was that members of the Working Party expressed a desire to share stories and experiences of their time in the East Perth area. 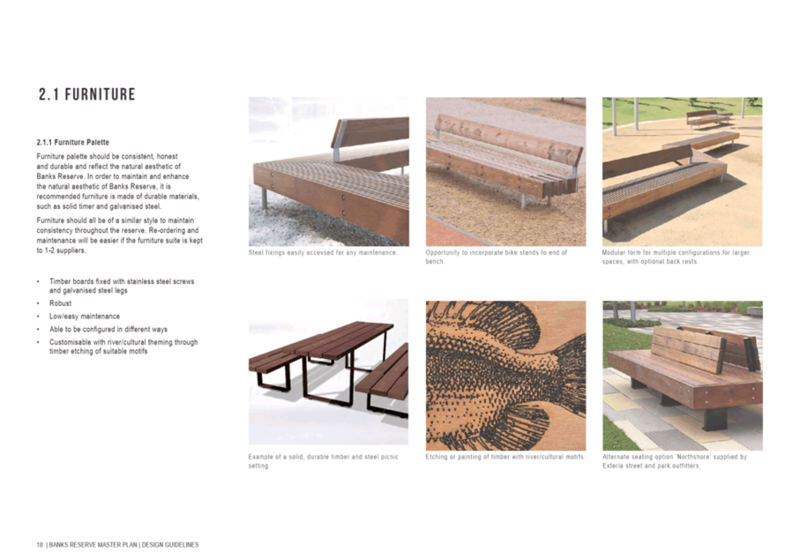 These stories will add significant value to the interpretive features and design elements at Banks Reserve and Administration has committed to liaising with the Working Party to ensure this occurs. It was identified that the City must engage with the Working Party again prior to progressing any proposed renaming or co-naming of the Reserve. Policy No. 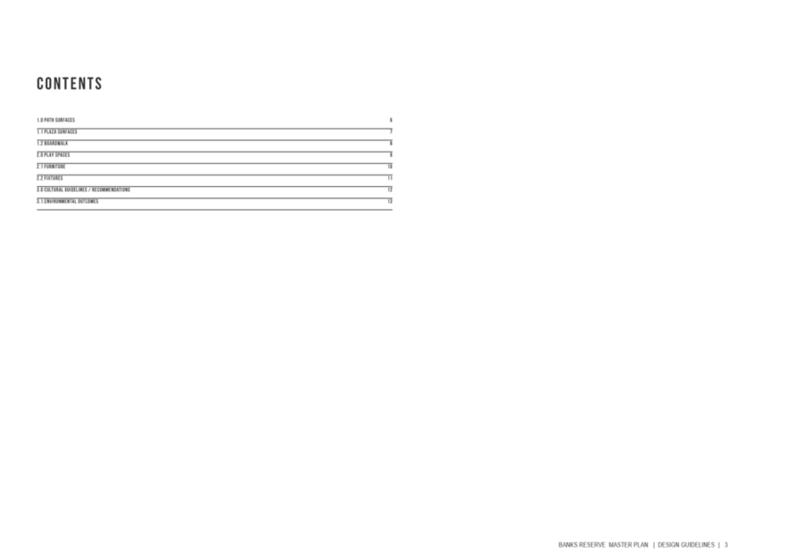 4.1.5 – Community Consultation. Medium: The Banks Reserve Master Plan has been prepared based on a comprehensive site planning and community consultation process. The recent public comment process has attracted a broad range of views and perspectives, both positive and negative, which now require consideration by both Council and Administration. While feedback from the public comment period has not led to any amendments to the Master Plan, much of it is valid and will be further assessed during the detail design phases that follow Council adoption. The natural environment contributes greatly to our inner-city community. We want to protect and enhance it, making best use of our natural resources for the benefit of current and future generations. “6. Re-establish, conserve and enhance floral and faunal biodiversity, native vegetation, green spaces and green linkages within the City. 6.3.1 Continue to replant areas of City-owned land with local plant and tree species to increase food and habitat areas, including native fringing vegetation as faunal habitat areas. 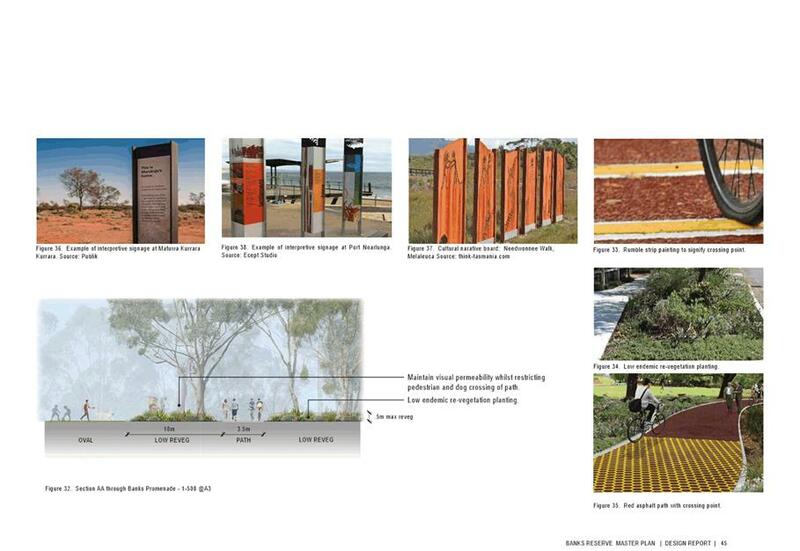 6.3.4 Identify cultural ties between the indigenous flora/fauna and the local Aboriginal people, with a view to establishing indigenous cultural gardens. 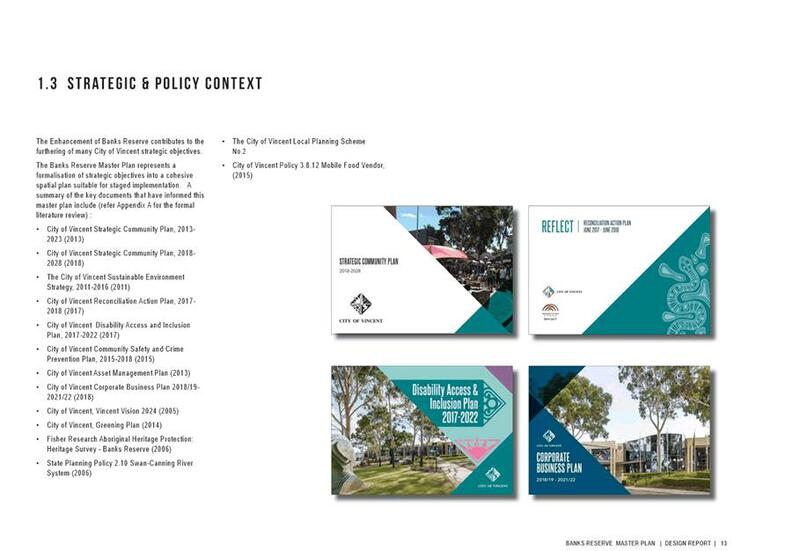 The Draft Master Plan includes proposed works and staged delivery over a number of financial years’, subject to consideration within the annual budget process and the long-term financial plan. The total estimated cost for implementation of the Banks Reserve Master Plan is $4,985,000 or $2,485,000 excluding the new community facility, which remains subject to further feasibility and business case development. It should be noted that the Master Plan order of magnitude cost estimates will be further refined through the project detailed design and procurement phases. Banks Reserve is a highly valued public open space. This has been reaffirmed through the level of community engagement during preparation of the Master Plan and the range of feedback received during the recent public comment period. 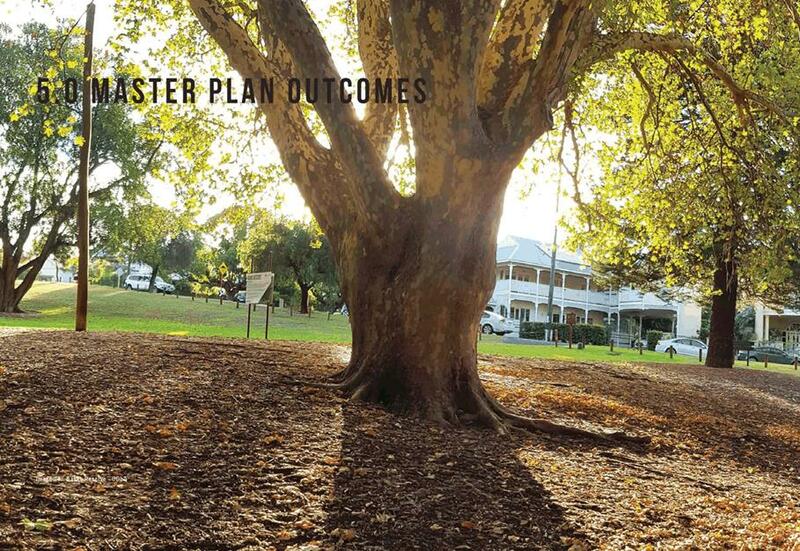 The Master Plan provides a coherent and coordinated vison to guide the future development and management of the Reserve, and implementation will ensure that community benefits from this high-quality natural asset are maximised. Responses received throughout the public comment period were generally in support of the Master Plan although there were a number of submissions that were not supportive and/or raised concerns regarding specific elements. Many of these concerns will be further considered and addressed through the detailed design phase for each Master Plan element. Other specific concerns have been comprehensively reviewed by Administration, and when balanced with key project findings and community feedback received during preparation of the Master Plan, no amendments or changes are necessary. 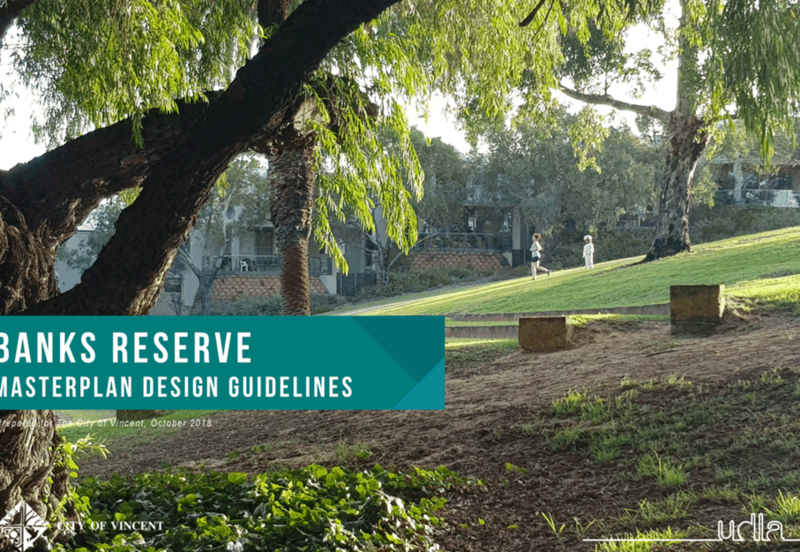 It is recommended that Council adopt the Draft Banks Reserve Master Plan and Design Guidelines as shown in Attachments 1 and 2. 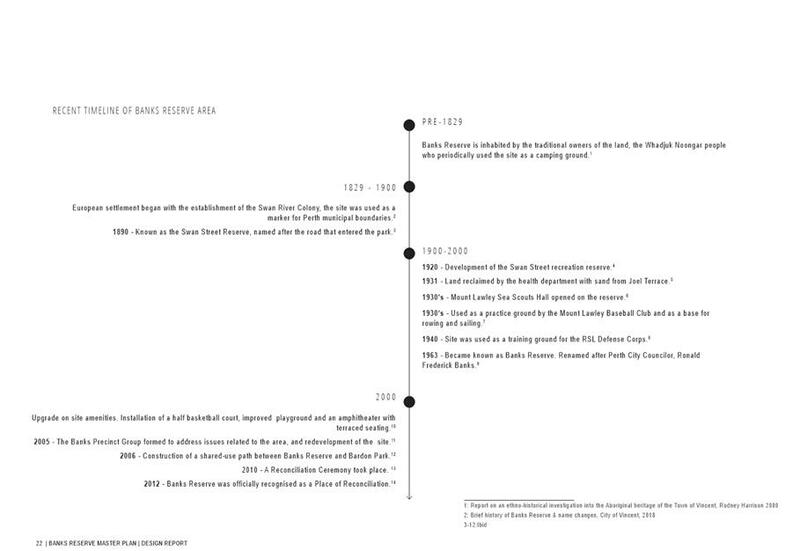 While the Master Plan includes advice on the potential renaming or co-naming of Banks Reserve this still requires further analysis, dialogue with the Whadjuk Working Party, and consultation with the local community. It is recommended that Council authorise Administration to progress potential renaming or co-naming in accordance with the Policies and Standards for Geographical Naming in Western Australia, and Council Policy No. 4.1.18 – Naming of City Facilities, Streets, Parks, Reserves and Buildings. 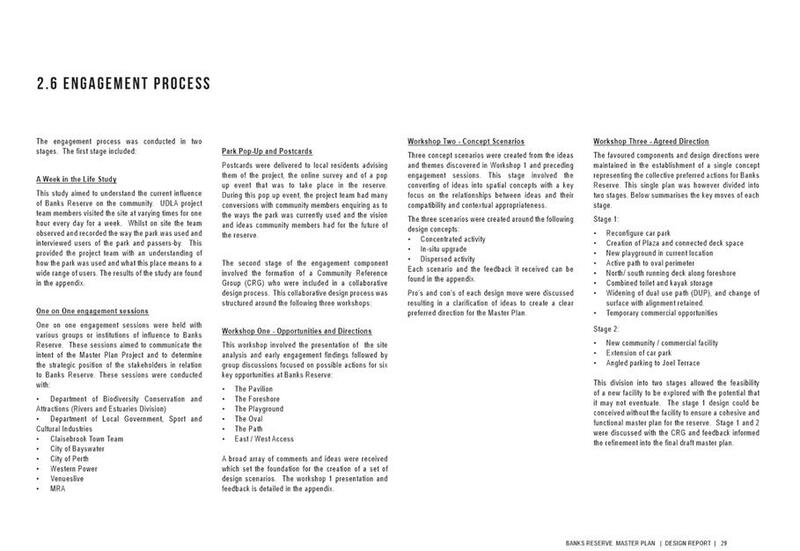 To advise Council of the results of the community consultation process conducted by the Department of Local Government, Sport & Cultural Industries (the Department) regarding the proposed inclusion of Robertson Park amongst the shortlisted sites within the State Tennis Centre Business Case. The abovementioned consultation was undertaken to enable both the Department and Tennis West to explain the scale and function of the proposed State Tennis Centre, articulate the impacts and benefits to the local community, present and discuss the preliminary concept plan, document key feedback and issues, and respond directly to any resident queries. The Department with support from the City delivered two public information sessions and released an online survey in December 2018 seeking views about the possible inclusion of Robertson Park within the State Tennis Centre Business Case. The first public information session was held on 13 December 2018 with nine community members in attendance and the second public information session was held on 19 January 2019 with 60 community members in attendance. A project bulletin and invitation to attend the information sessions were sent to all residents and businesses located within a 400 metre radius of Robertson Park. 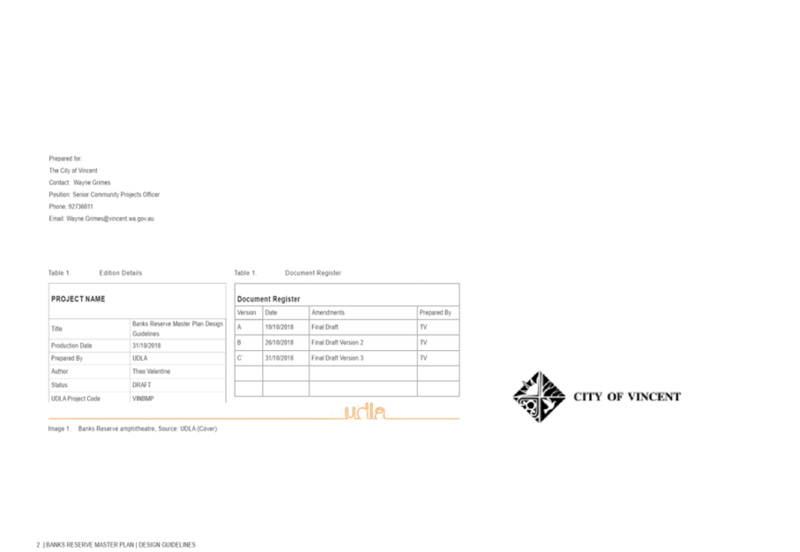 Throughout the consultation period an online survey and key project information was available on the City’s Imagine Vincent engagement portal. A total of 61 people completed the online survey with 11 supporting the proposal and 50 not supporting the proposal. There were also a number of submissions received as written correspondence rather than the online survey, and while some submissions were in support of the proposal, again the majority were not in support of the proposal. This was by far the biggest area of concern raised by the community. Key concerns were that parking is already an issue in the area, the potential impact of State Tennis Centre visitors on event days, where the parking would be located, and potential impact on park amenity. Given proximity to the Perth CBD and location on Fitzgerald Street it is acknowledged that parking management would be a key issue associated with the proposed State Tennis Centre that would require innovative and effective management. Similar to the comments received regarding car parking the key concerns raised were that traffic congestion is already an issue in the area, the potential impact of additional State Tennis Centre traffic on event days, and potential impact of increased traffic on park amenity. Again, given proximity to the Perth CBD and location on Fitzgerald Street it is acknowledged that traffic management would be a key issue associated with the proposed State Tennis Centre that would require effective management. 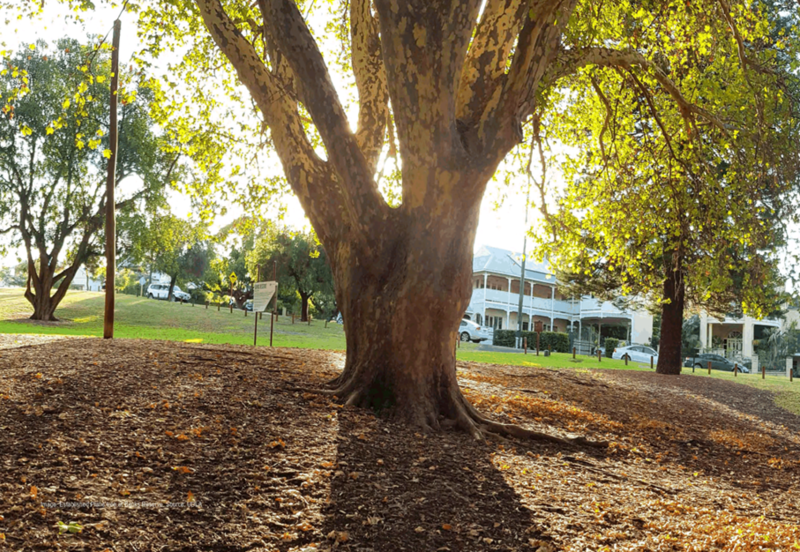 Concerns were raised regarding the potential loss of ‘heritage/significant trees’ in and around the proposed State Tennis Centre site and the potential loss of accessible public open space. 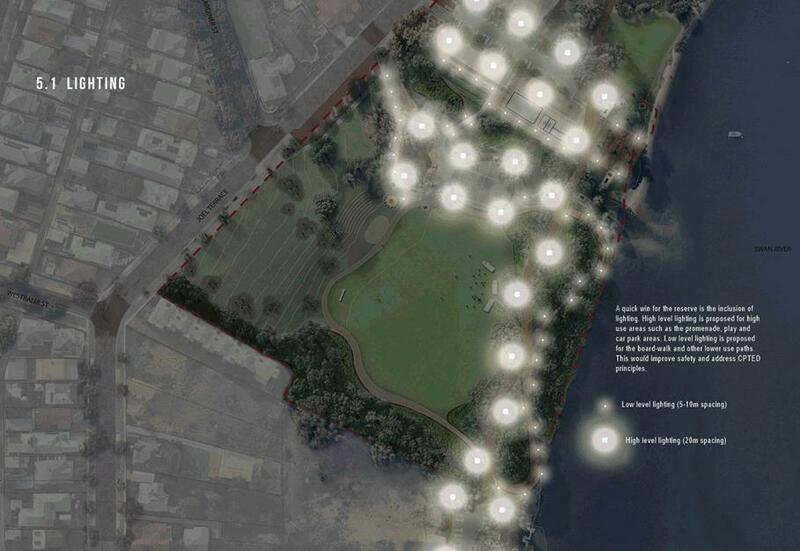 The concept presented by the Department was an artist’s impression only depicting potential site layout given that Robertson Park was amongst several shortlisted sites. The City had already advised the Department that existing trees would need to be retained where possible and additional tree planning would likely be necessary. The Department was also advised that the proposed State Tennis Centre footprint would need to be maintained within the current Robertson Park tennis courts lease area particularly given the findings and outcomes of the City’s Public Open Space Strategy. These matters were to be further investigated and refined if Robertson Park was identified as the preferred site for the State Tennis Centre. Concerns were expressed that the existing Robertson Park tennis courts lease area was too small for the proposed State Tennis Centre footprint. 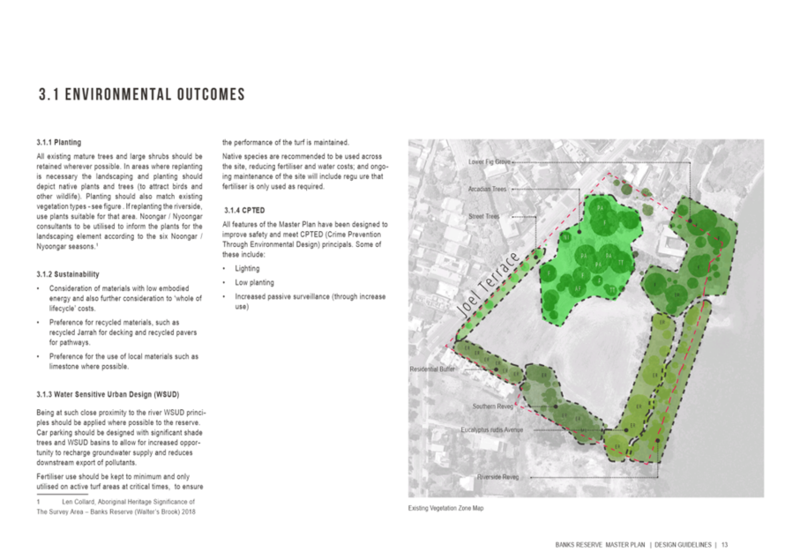 The concept presented by the Department was an artist’s impression only depicting potential site layout given that Robertson Park was amongst several shortlisted sites. Administration advised the Department that the proposed State Tennis Centre footprint would need to be maintained within the current Robertson Park tennis courts lease area and the Department has reaffirmed that the site was indeed large enough to accommodate the Centre. Concerns were raised regarding the increased tennis activity that would require extended use of floodlights and the associated light spill that would negatively impact nearby residents. It is acknowledged that the State Tennis Centre would attract additional usage including night time usage that would require floodlights. The Department advised that the floodlights would be latest technology with very low light spill. 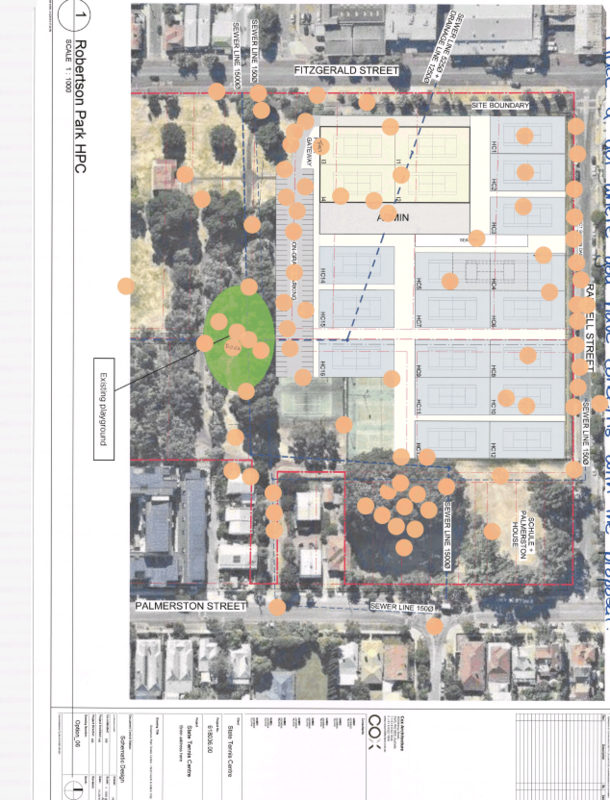 The increased heat impact from the proposed hard tennis courts compared to the existing grass tennis courts was identified as an issue for nearby residents and park users. By their very nature tennis hardcourts would generate more heat compared to grass tennis courts although there are also a range of functional and maintenance benefits associated with this change. 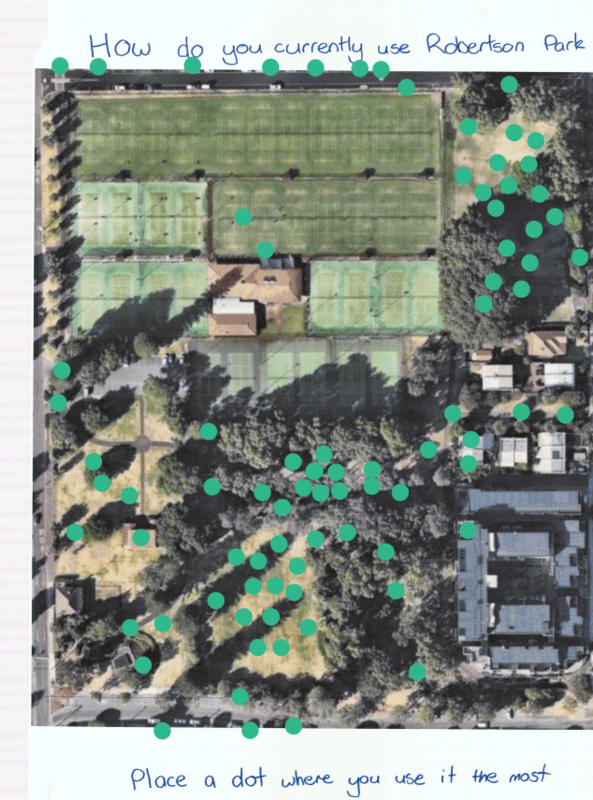 Concerns were raised regarding additional noise that would be created by the State Tennis Centre and the subsequent impact on adjacent residences and businesses as well as park users. While the Robertson Park tennis courts already generate noise it is acknowledged that events at the State Tennis Centre may increase noise impacts at certain times. 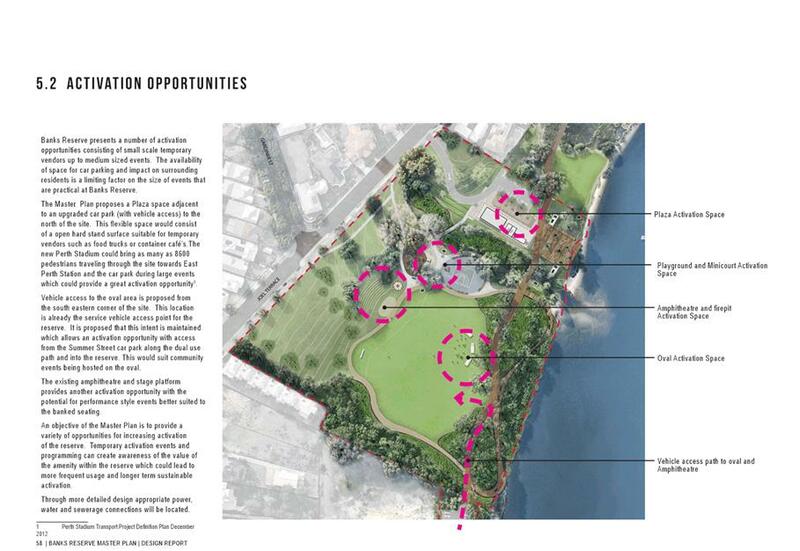 The concept presented by the Department was an artist’s impression only depicting potential site layout given that Robertson Park was amongst several shortlisted sites. 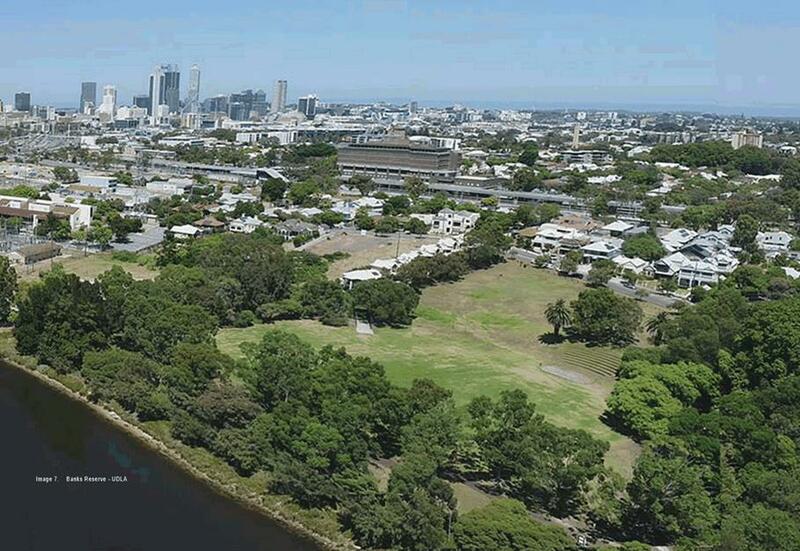 Detailed site design and noise management were to be further investigated and refined if Robertson Park was identified as the preferred site for the State Tennis Centre. The conversion of existing grass courts to hard courts was identified as an issue both from a heat and amenity perspective. The conversion of grass courts to hard courts has been identified as a key priority within the Tennis West Strategic Facilities Plan, and provides a range of functional and maintenance benefits. This conversion could arguably have a negative impact on park aesthetics. Robertson Park is currently an approved off leash dog exercise area and concerns were raised that the State Tennis Centre would lead this being changed. The proposed State Tennis Centre was to be maintained within the existing Robertson Park tennis courts lease area with the remaining park areas unimpacted. There was no intention to modify the existing approved off leash dog exercise area. The potential removal of the existing playground was noted and not supported. 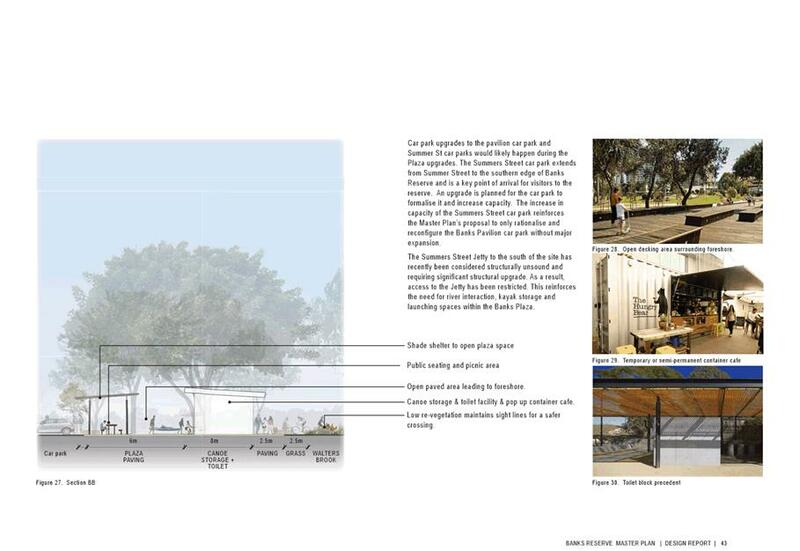 While the initial artist’s impression showed the State Tennis Centre impacting the playground area the Department reissued the concept design confirming that playground would remain in-situ. 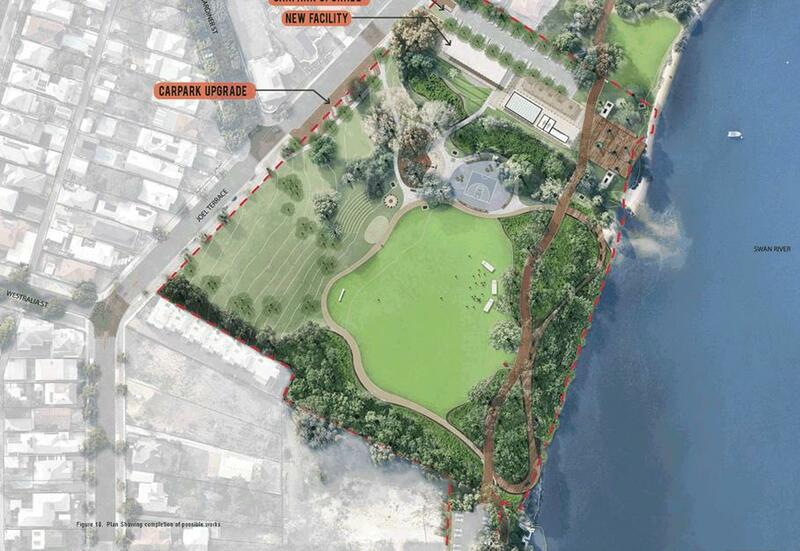 Again, specific site design was to be further investigated and refined if Robertson Park was identified as the preferred site for the State Tennis Centre. General comments were received that the increased noise, congestion and activity at Robertson Park would potentially impact amenity in the local area and subsequently housing values. 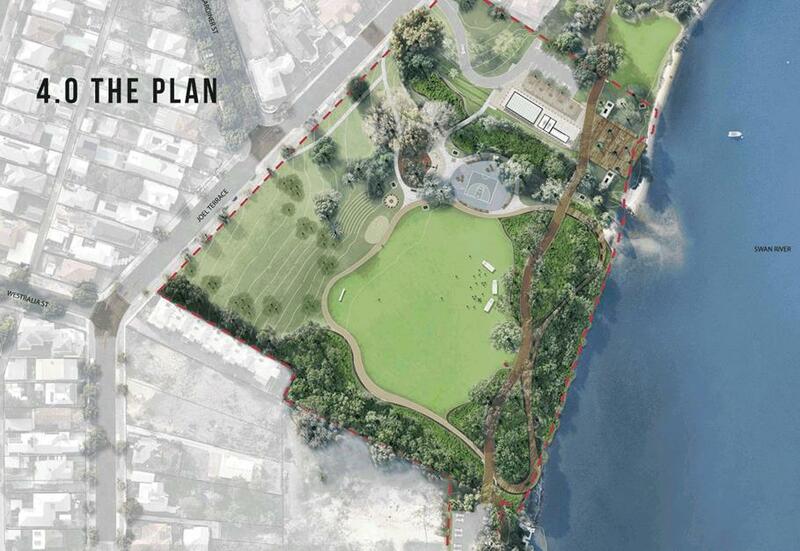 The State Tennis Centre would inevitably increase activity at Robertson Park. Administration cannot speculate on negative or positive impacts to housing values in the surrounding area. Concerns were expressed that location of the State Tennis Centre at Robertson Park would mean that access for grassroots/community tennis would decrease. The Department and Tennis West assured residents at the public information sessions that community access to the tennis courts would be maintained, including the online ‘book a court’ system. 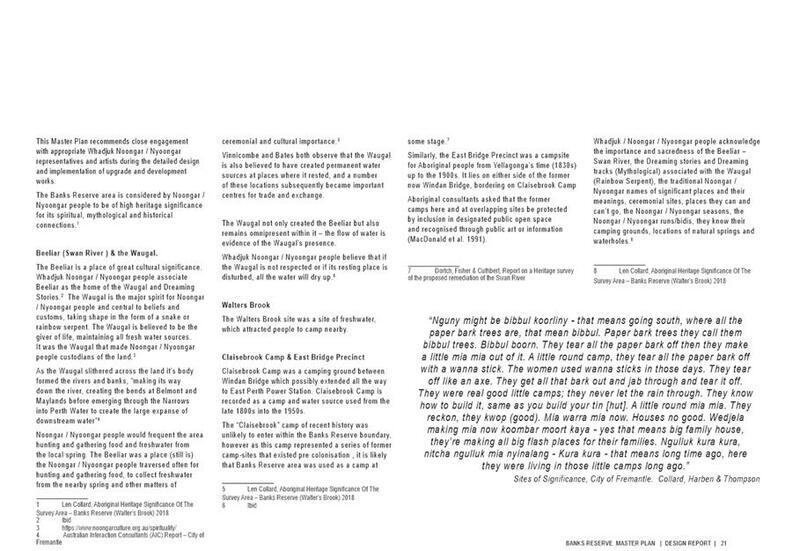 The negative impact of the State Tennis Centre on site heritage and Aboriginal signifance were raised as concerns. 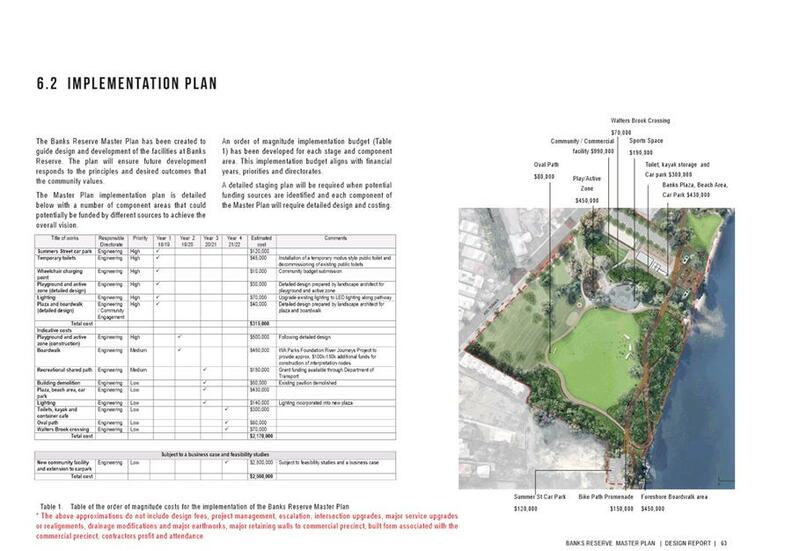 These important considerations were identified by the Department through the initial site analysis, and would be further investigated and responded to appropriately if Robertson Park was identified as the preferred site. A range of other issues were raised during the community consultation including access to public transport or lack of, and the proposed size and scale of the indoor tennis court facility. The Department advised that public transport availability along Fitzgerald Street had been assessed and further transport options would be identified if Robertson Park was identified as the preferred site. The proposed State Tennis Centre remained subject to more detailed design and necessary development approvals to ensure appropriate size, scale and location. 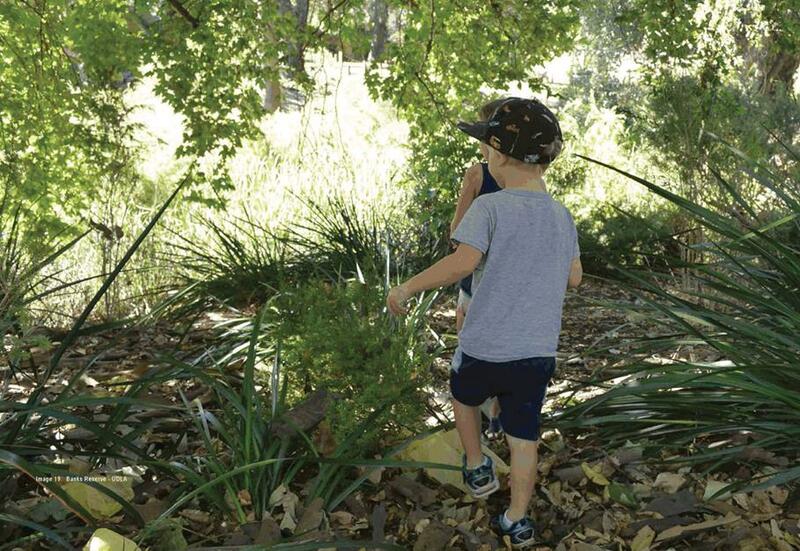 At the public information session held on 19 January 2019, Administration sought direct feedback from residents to identify key areas of concern and how the park is currently utilised. 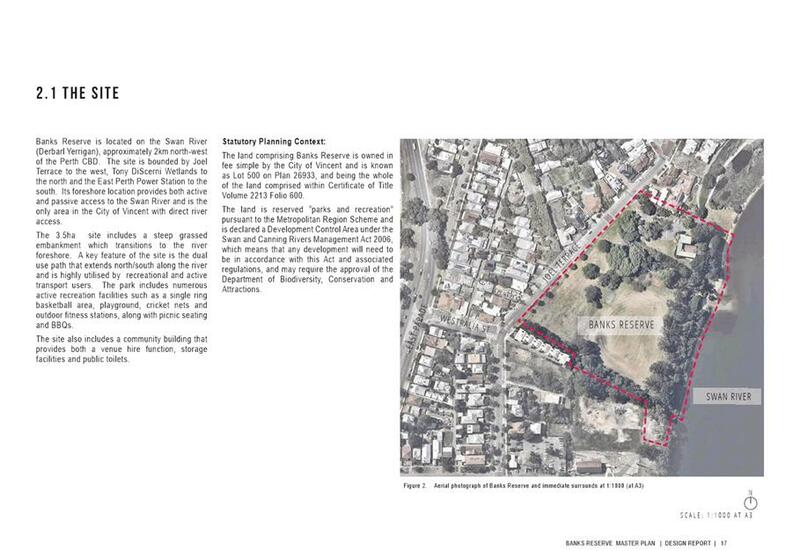 This feedback overlayed on aerial maps of Robertson Park has been provided as Attachments 1 and 2. The information will be maintained and further analysed by Administration as the basis for any future planning of Robertson Park. Importantly, during the community consultation phase the Department formally advised that in response to the community sentiment and concerns raised Robertson Park would no longer be included amongst the shortlisted sites within the State Tennis Centre Business Case. Consultation was undertaken in accordance with Council Policy No. 4.1.5 – Community Consultation which requires consultation to take place with residents of a selected target area in the case of major reserve development proposals. 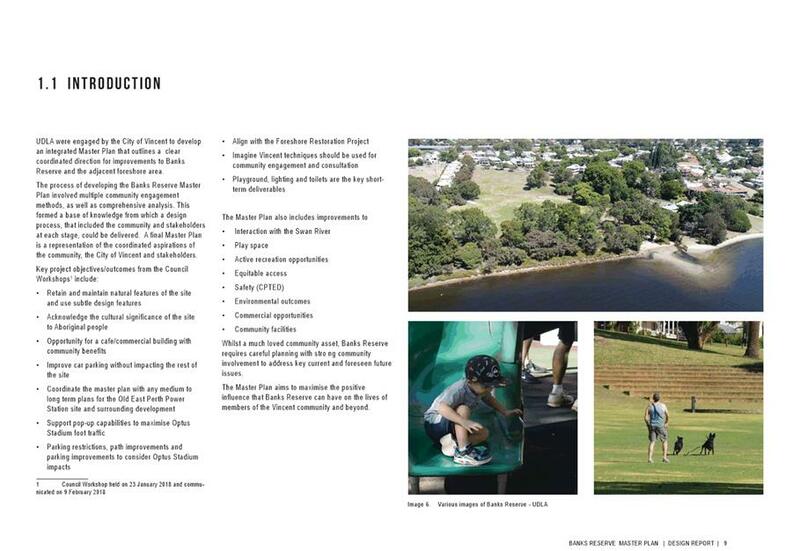 This included the provision of a project bulletin to residents/businesses located within a 400 metre radius of Robertson Park and two public information sessions. 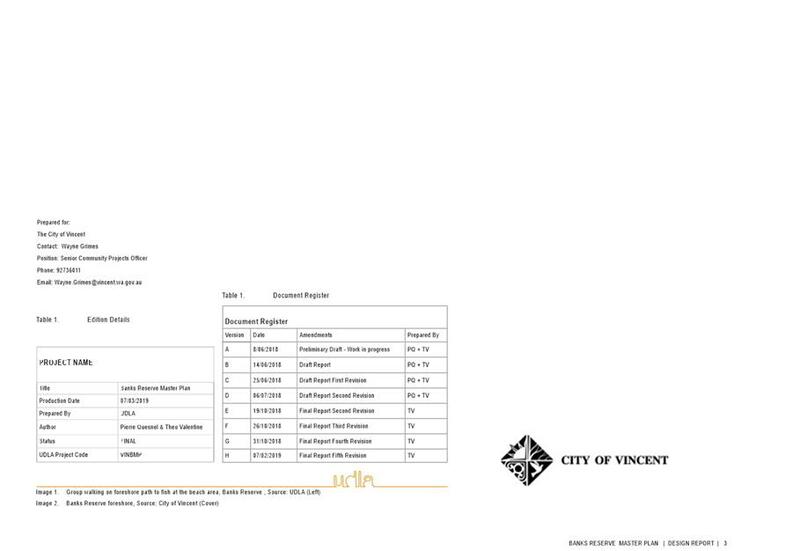 Key project information and an online survey was also available through the City’s Imagine Vincent engagement portal. Consultation should generally be avoided between the mid-December to mid-January period and for that reason, the process commenced early December with the first public information session held on 13 December 2018 and the second session held on 19 January 2019. The consultation period was initially due to close on 20 January 2019 following the second public information session on 19 January 2019, however due to extent of concerns received the consultation period was extended to 31 January 2019. 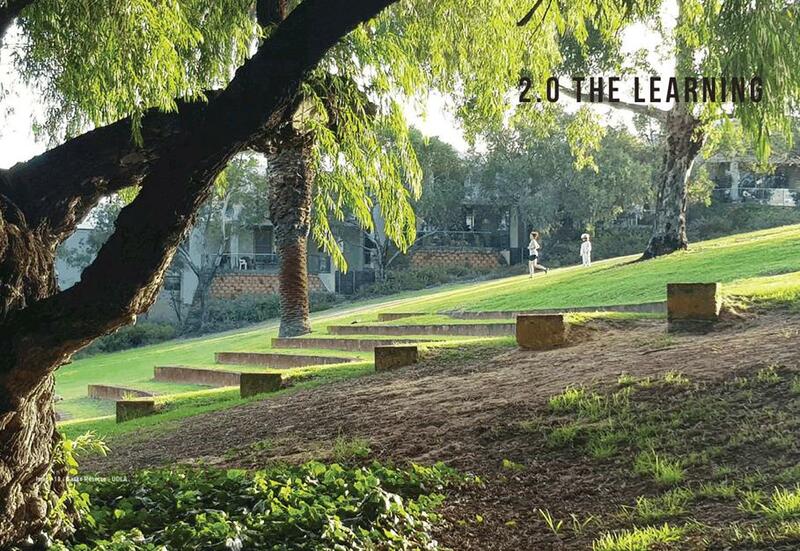 Low: Inclusion of Robertson Park amongst the shortlisted sites within the State Tennis Centre Business Case was regarded as low risk given that such approval would not represent a binding commitment to the development of the State Tennis Centre at that location. Costs associated with community consultation were met by the Department and within existing Administration operational budgets. In response to feedback received during the community consultation period to the Department has already advised that Robertson Park will no longer be considered amongst the shortlisted sites within the State Tennis Centre Business Case. 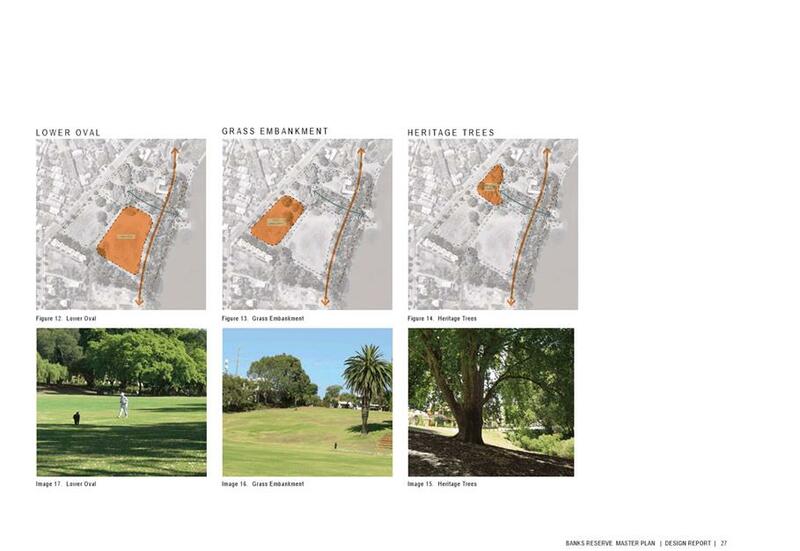 As per the City’s Public Open Space Strategy, a development plan is required for Robertson Park to guide future use, management and development of the site albeit without a State Tennis Centre. This includes the tennis courts and associated amenities that require capital improvements and negotiation of new lease arrangements. 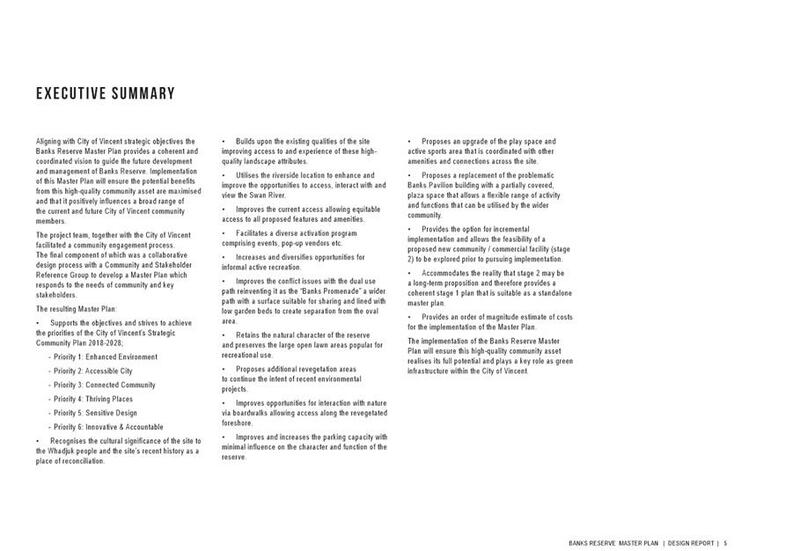 It is recommended that the Chief Executive Officer consider funding/timing options for preparation of this development plan within the context of the City’s Corporate Business Plan, Annual Budget and Long Term Financial Plan.